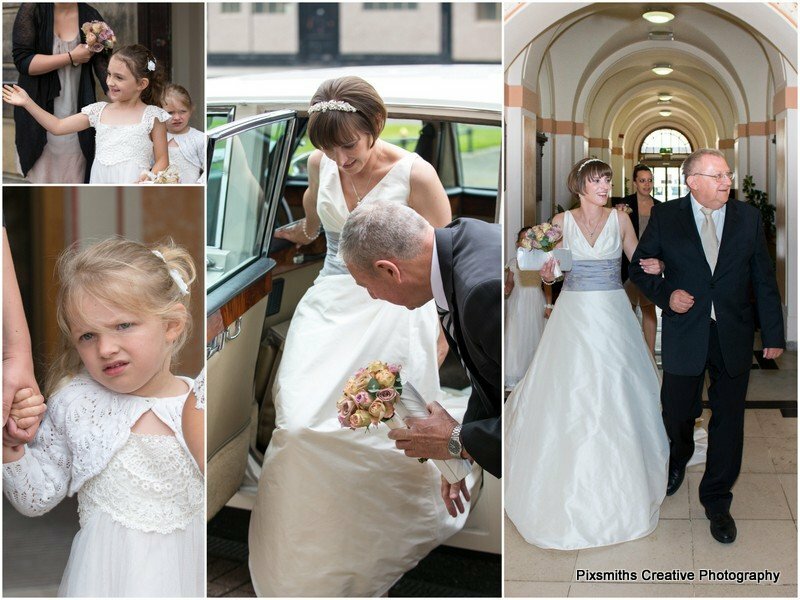 Did you know that Pixsmiths have flexible packages that can cover ceremony and portraits at a single venue for just a couple of hours? 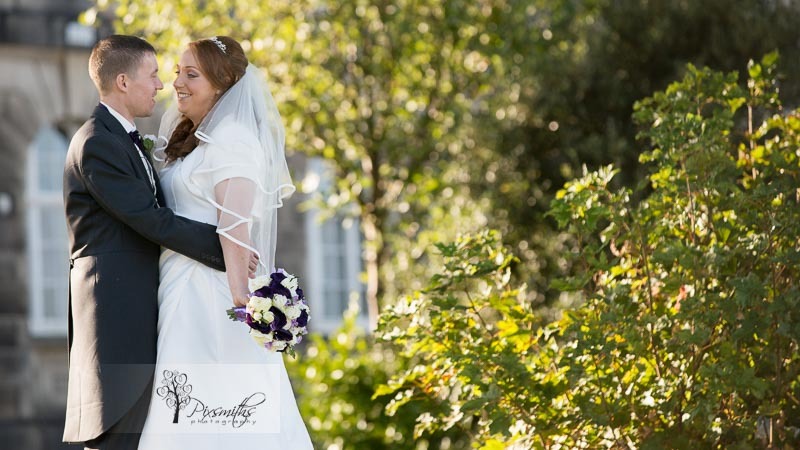 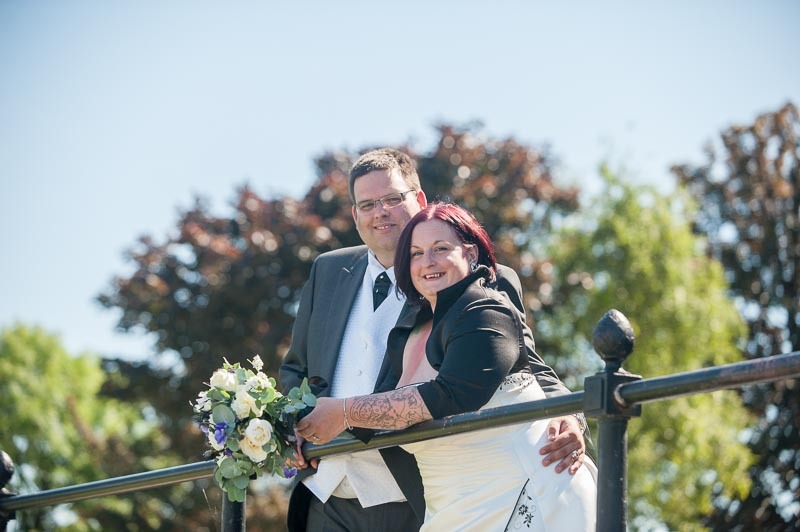 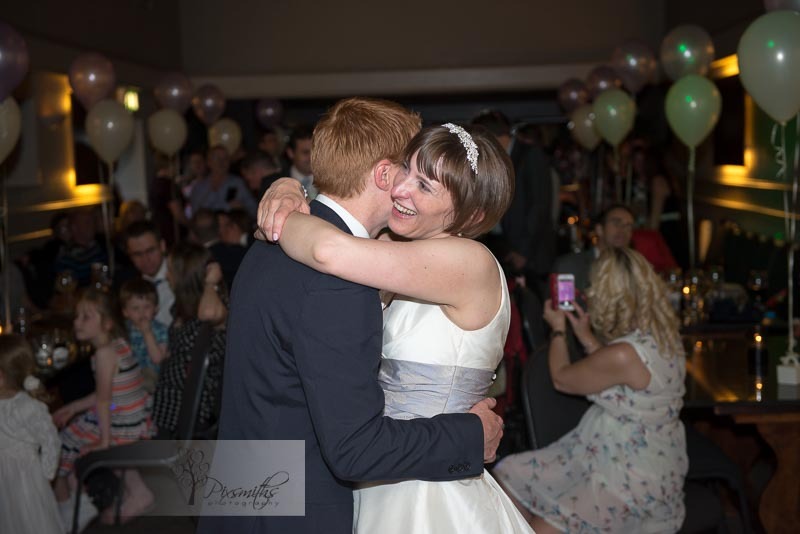 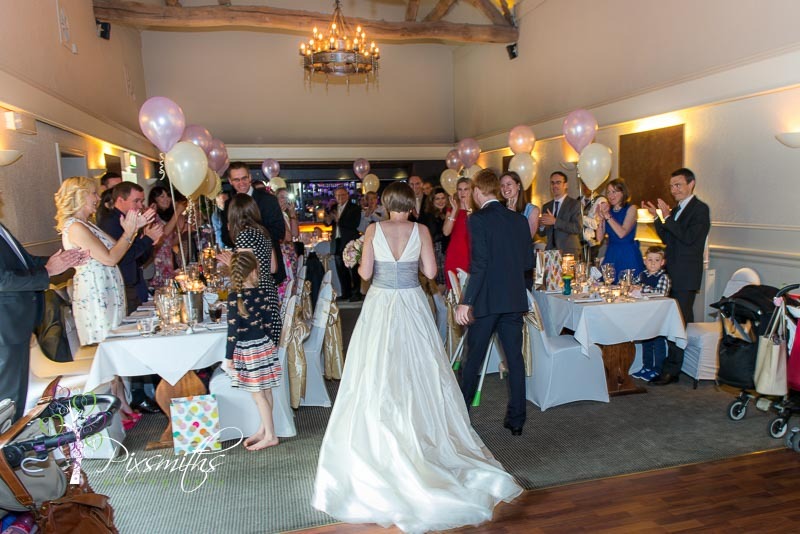 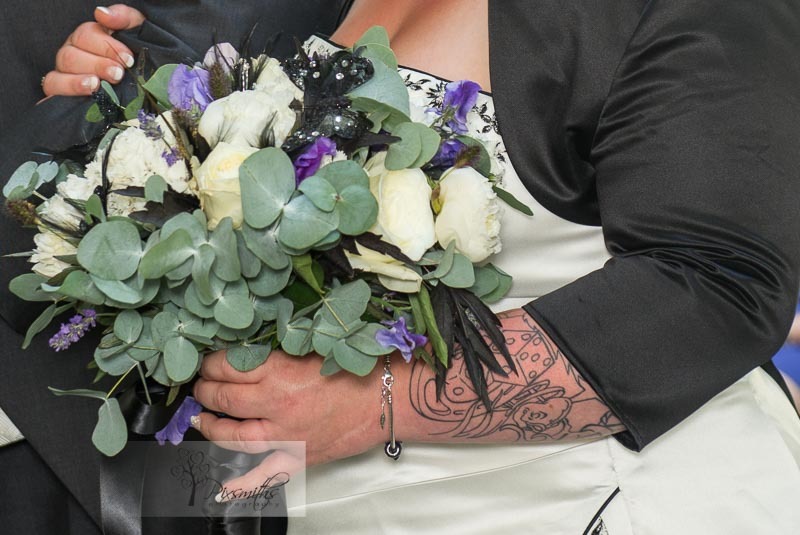 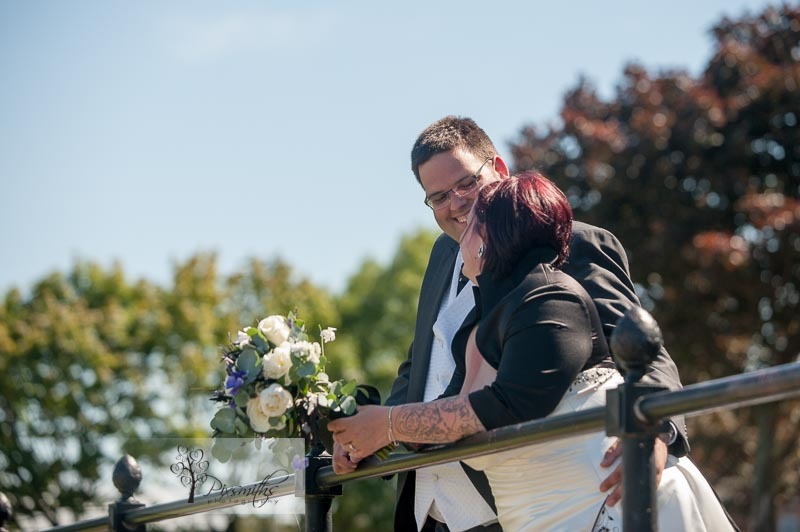 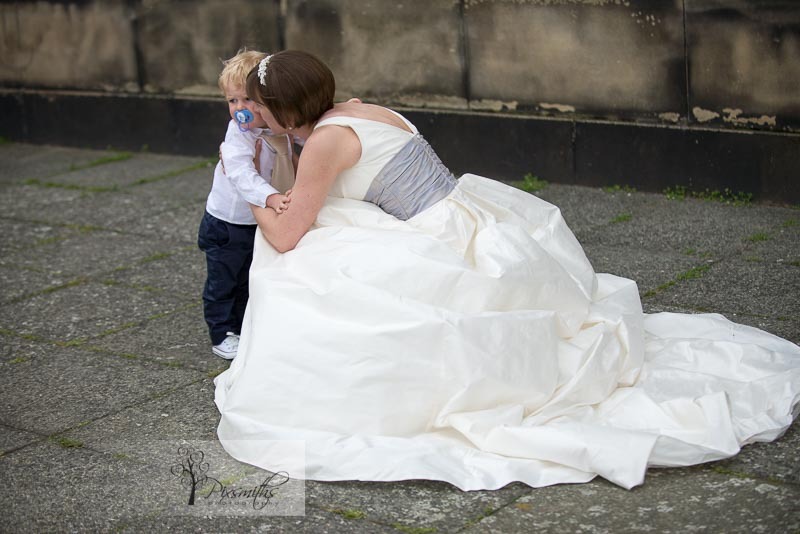 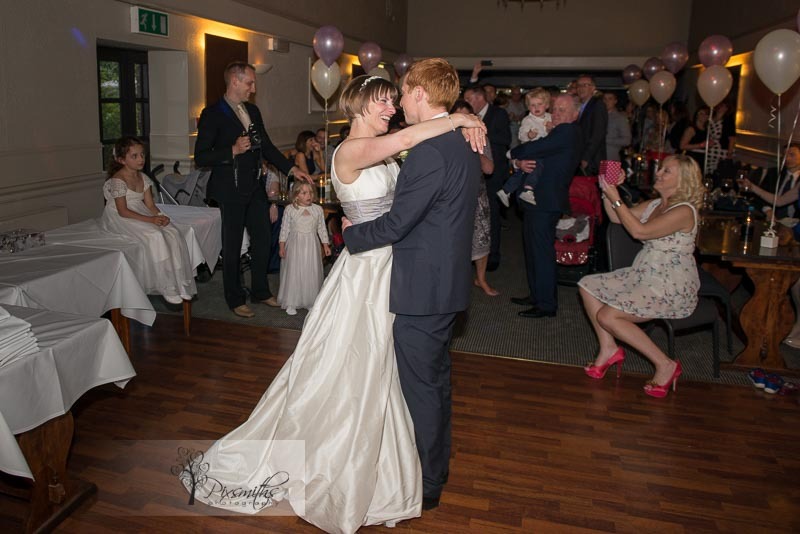 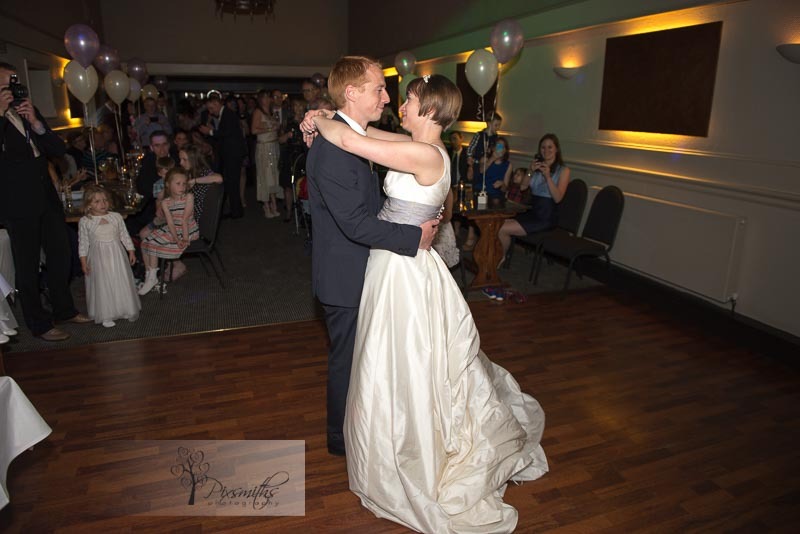 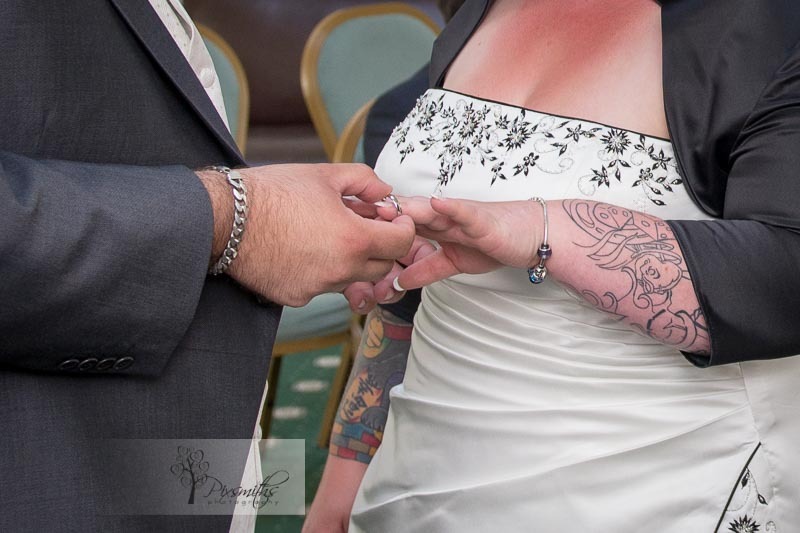 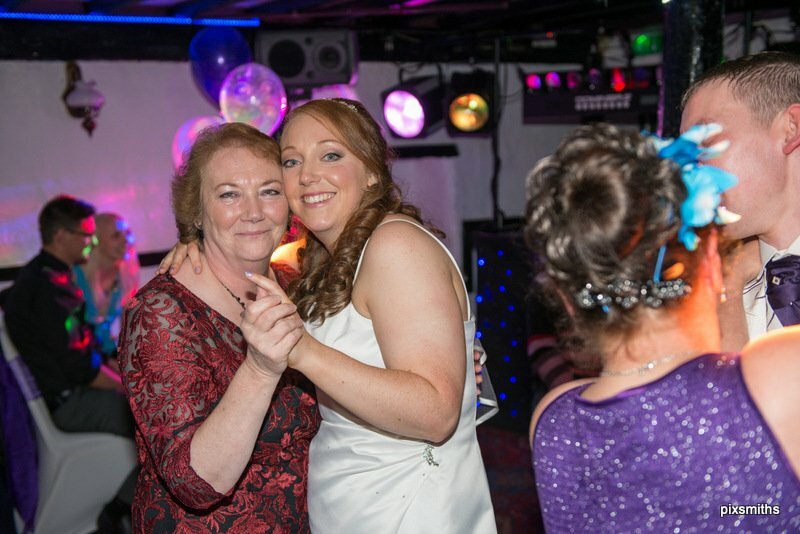 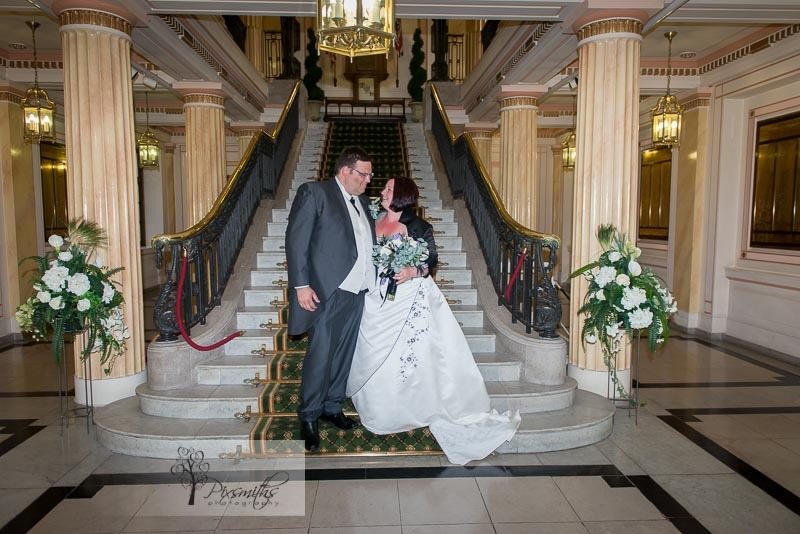 Its lovely when a couple really appreciate having professional photography to cover the most important aspects of the day even if not having a more traditional full on day and evening do. 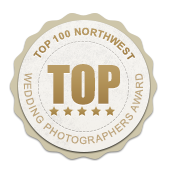 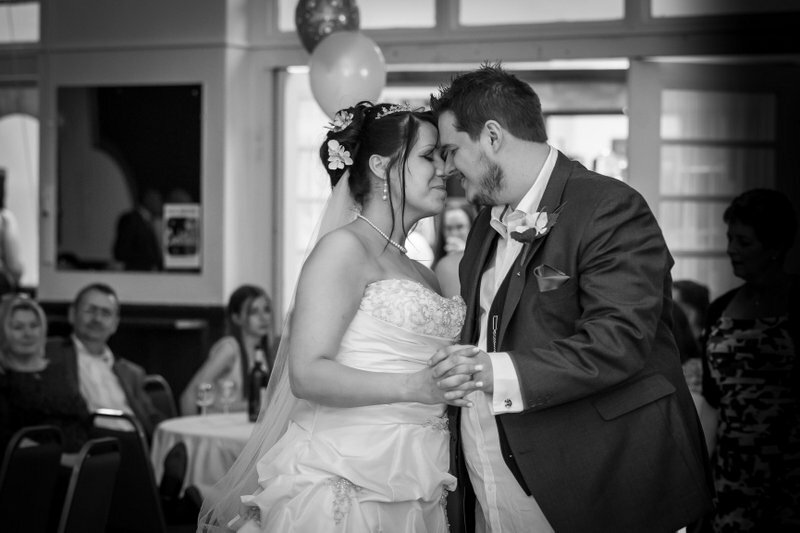 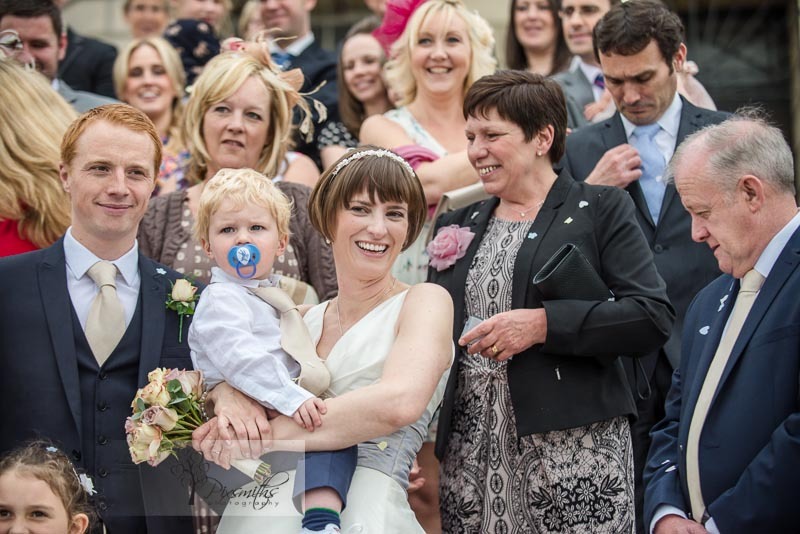 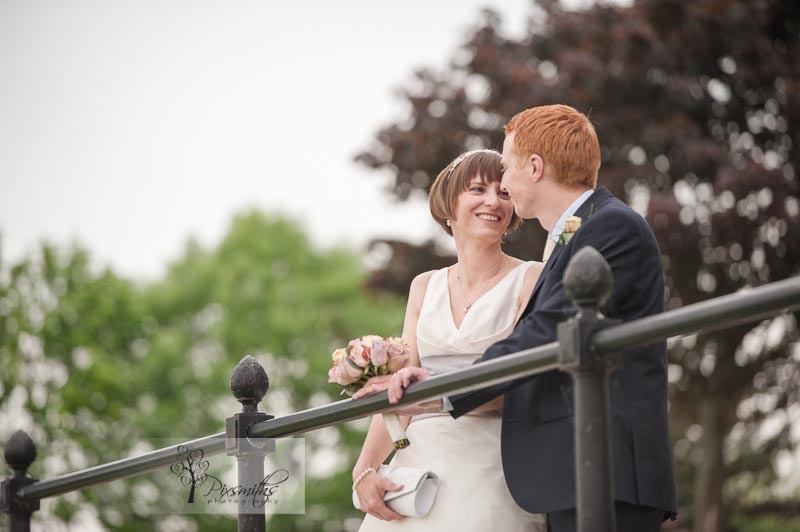 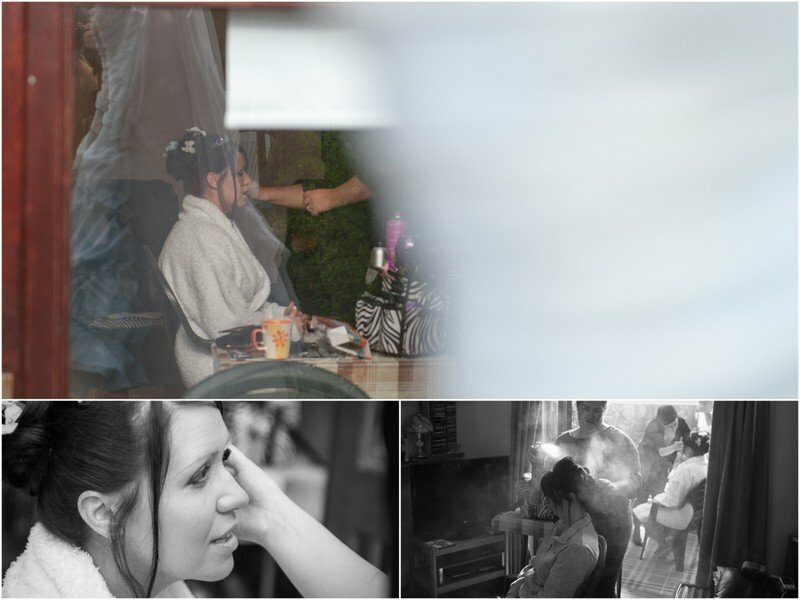 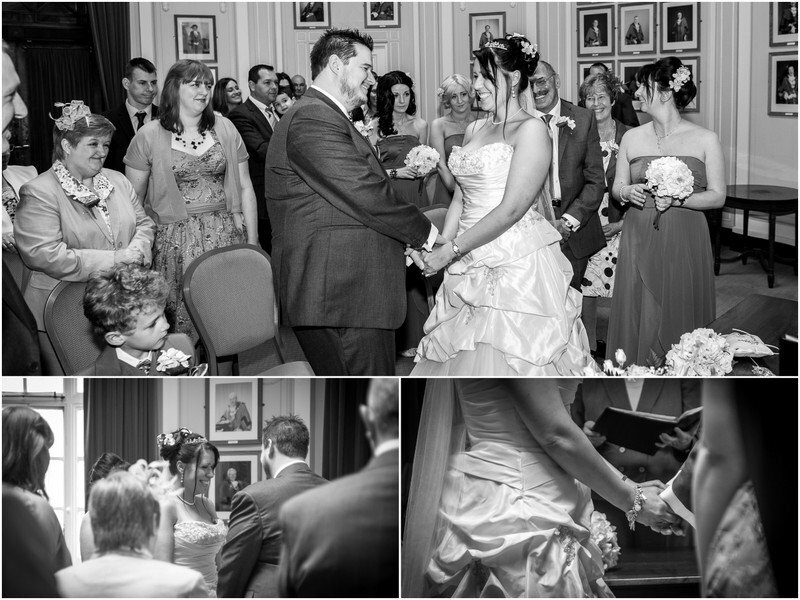 Capturing the emotions of a day is what we are all about and what our couples love about our work. 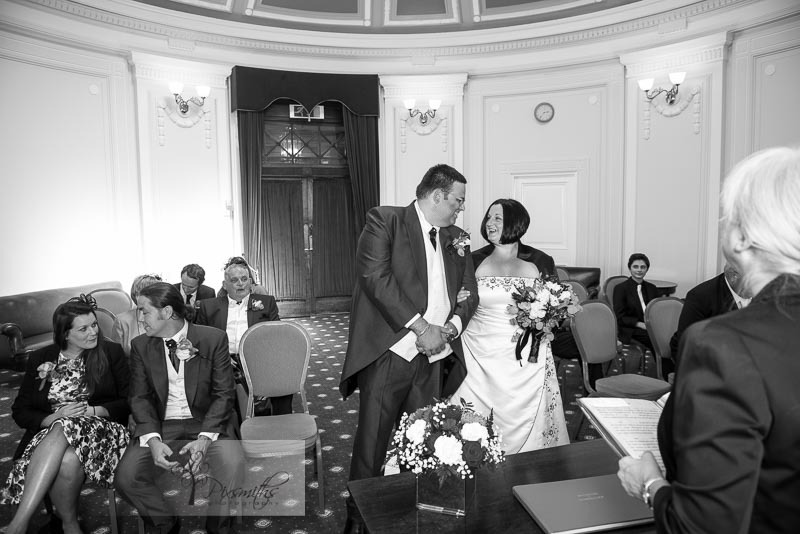 All arrived well on time for a late afternoon civil ceremony. 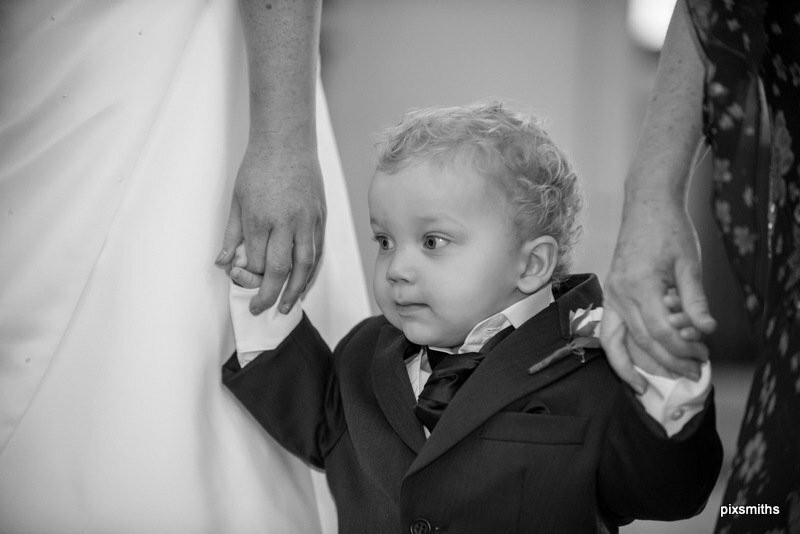 Their son Leo looked so cute in his suit too! 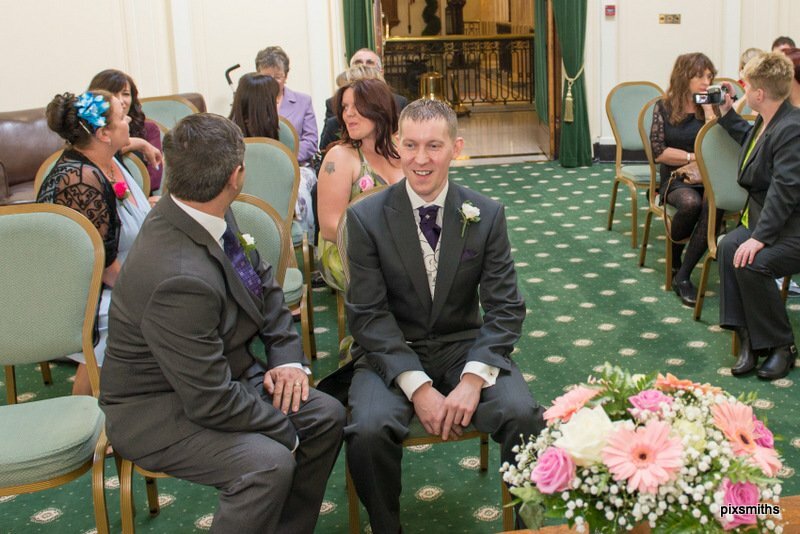 An intimate ceremony – it was so touching to see how caring Jeff was to Gayle with the emotions of meeting him at the aisle. 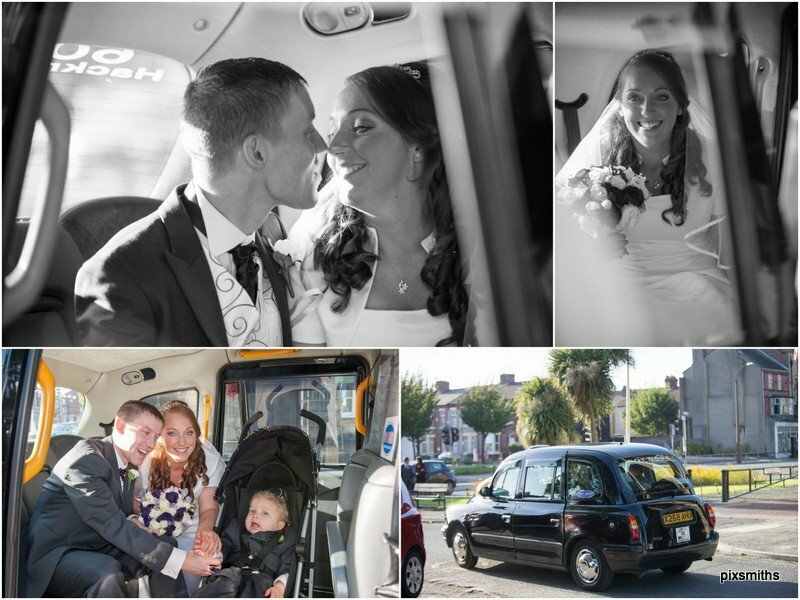 Time for groups and portraits afterwards and soon it was time for them to be on their way – in the black cab to The Saddle Club for their evening party. 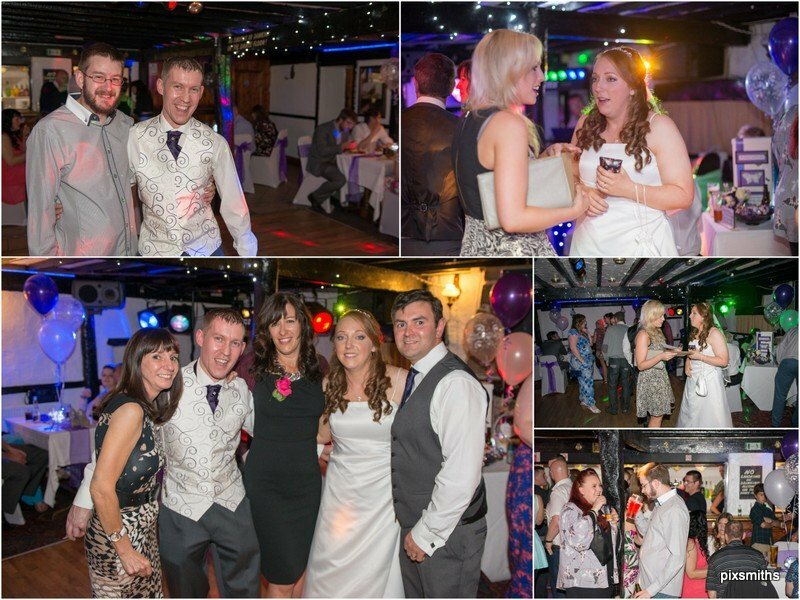 As part of a flexible package we popped into the Saddle Club later in the evening to capture a few evening shots and first dance. 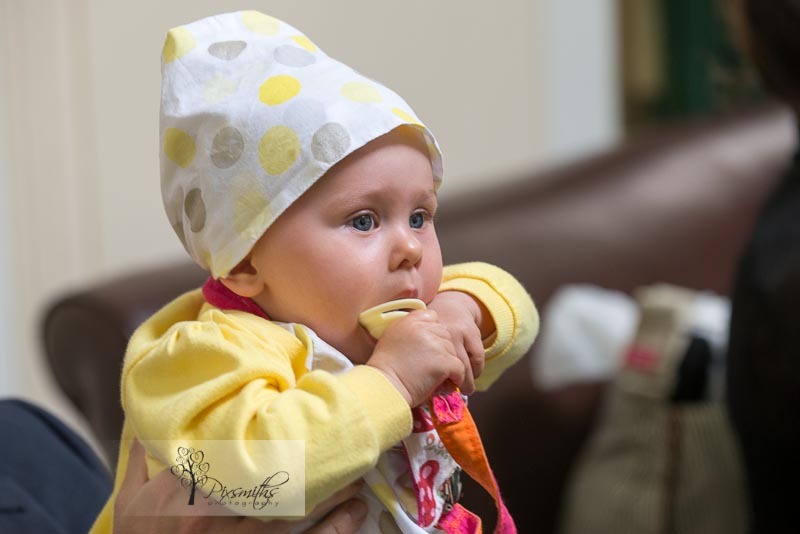 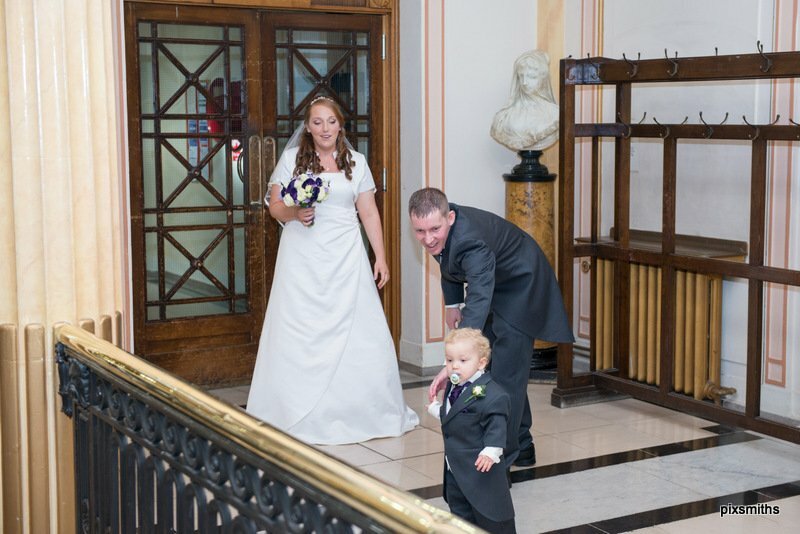 Did you know that Pixsmiths Creative Photography are available for mini sessions ideally suited for mid-week Town Hall weddings? 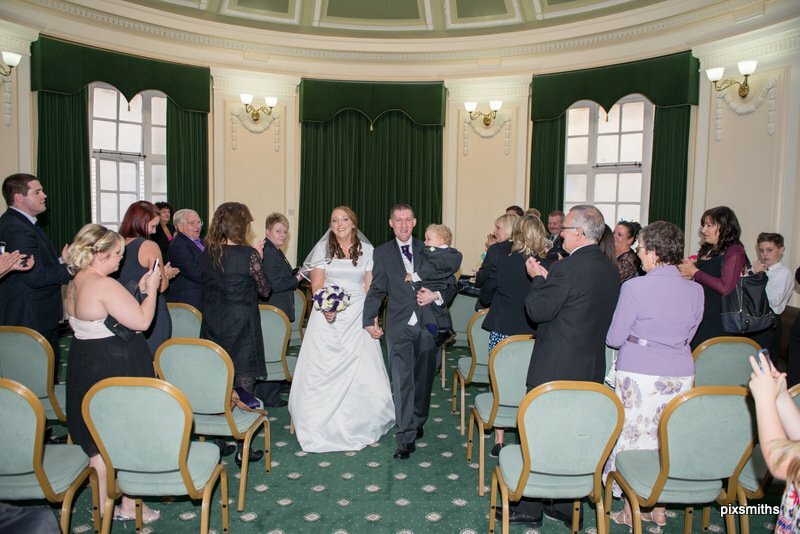 Birkenhead Town Hall weddingds and Wallasey Town Hall weddings applicable to this. 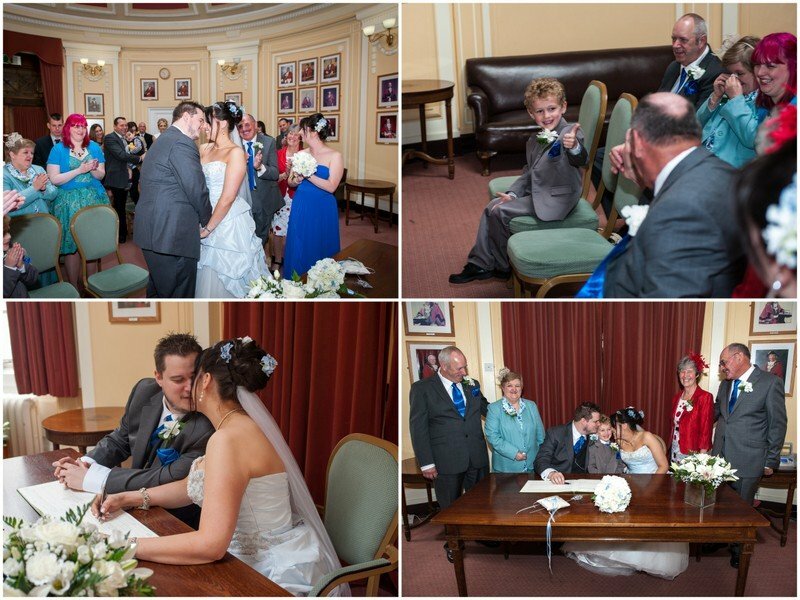 David, a photographer himself, appreciated the importance of having the salient moments of a wedding captured by a professional, fully insured to shoot at the Town Hall. 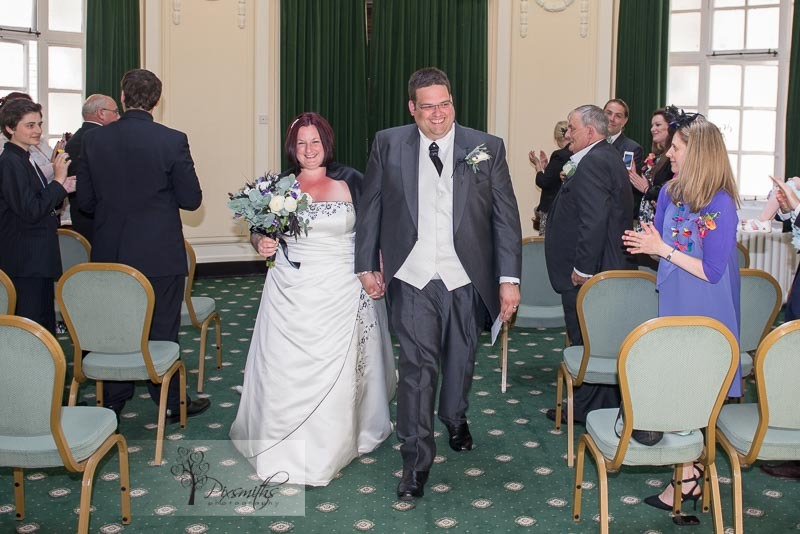 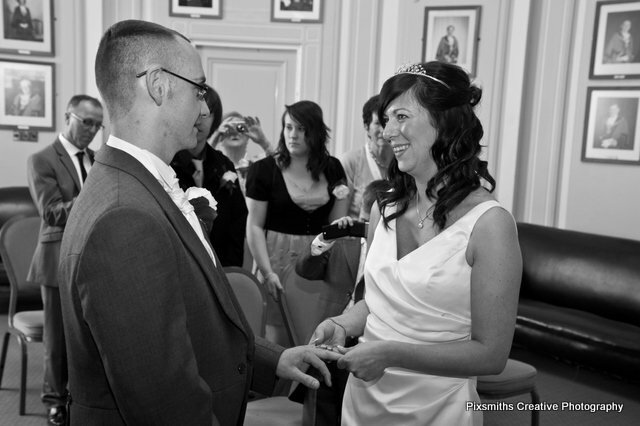 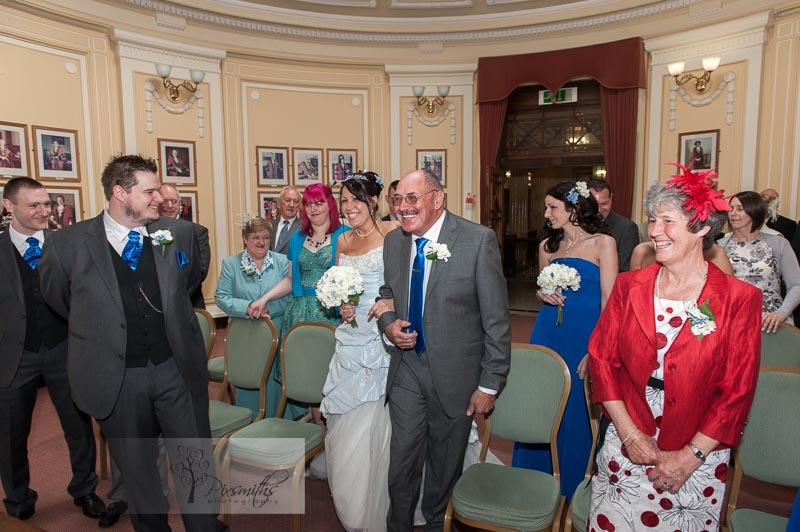 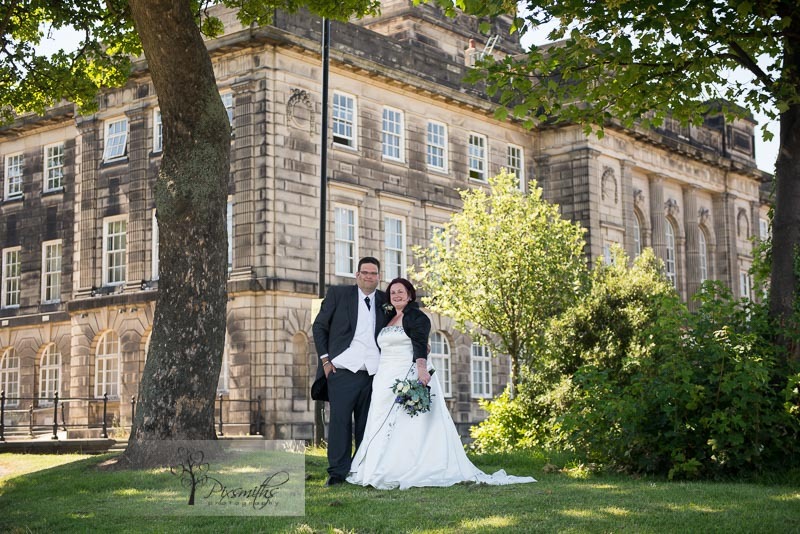 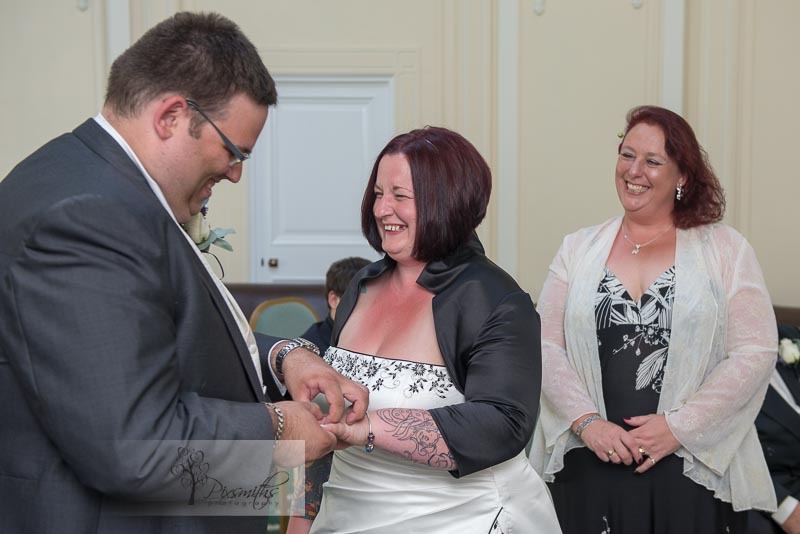 So it was a pleasure to capture Trudy and David’s ceremony recently at Wallasey Town Hall. 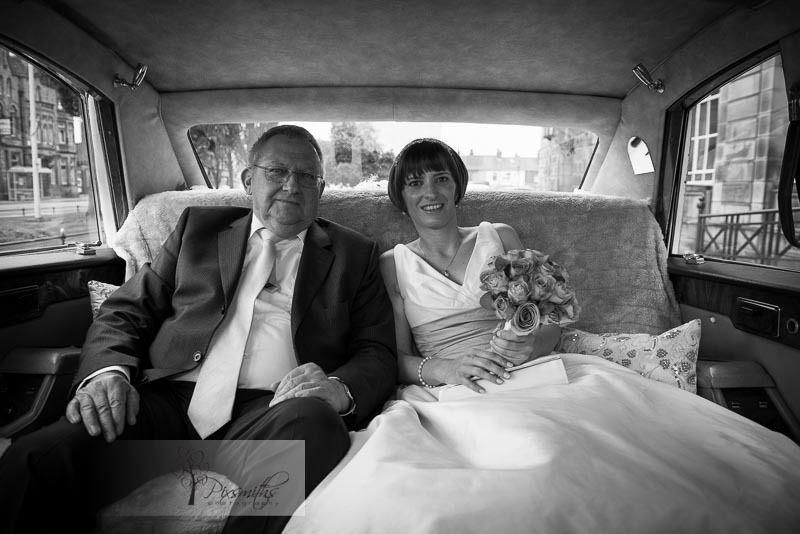 It was importance for David to get some memorable candid shots of his parents too which we happily obliged . 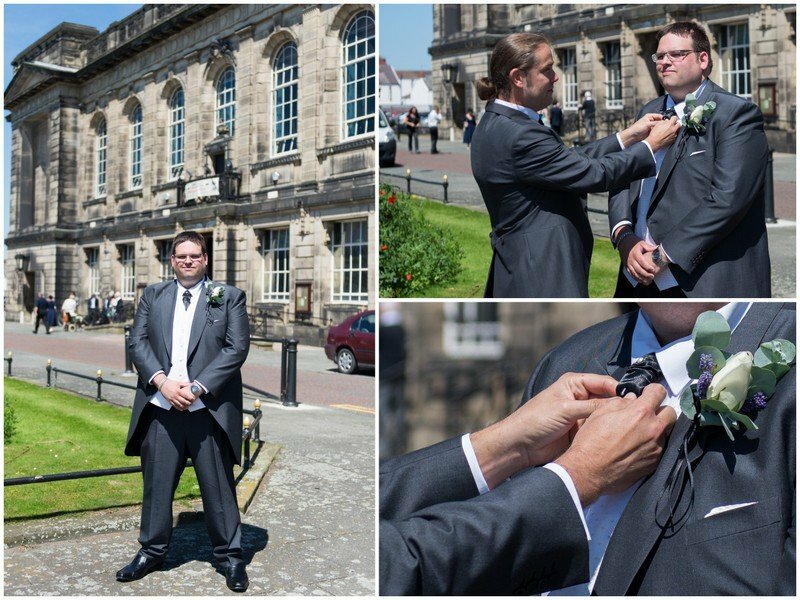 A 90 minute session is enough to cover Groom shots, bride’s arrival, ceremony and a few group and bride and groom shots afterwards. 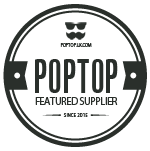 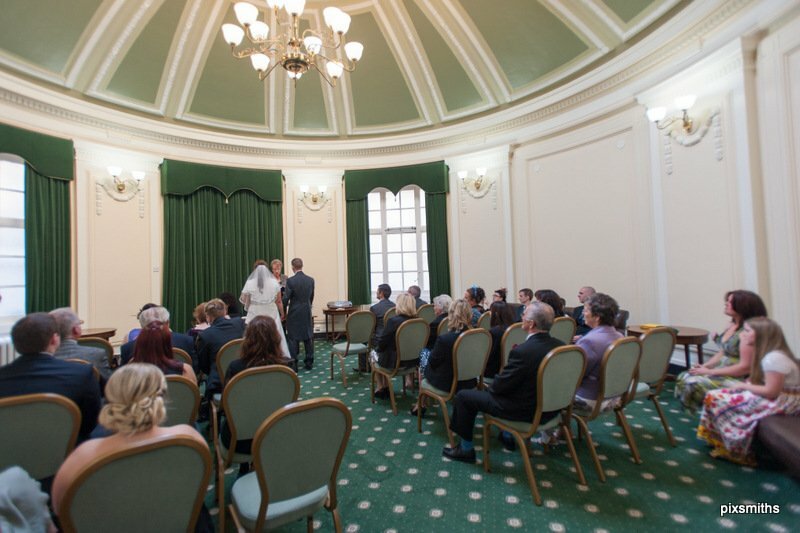 Of course cover can be extended to ceremony if required – minimum 3 hour coverage for this. 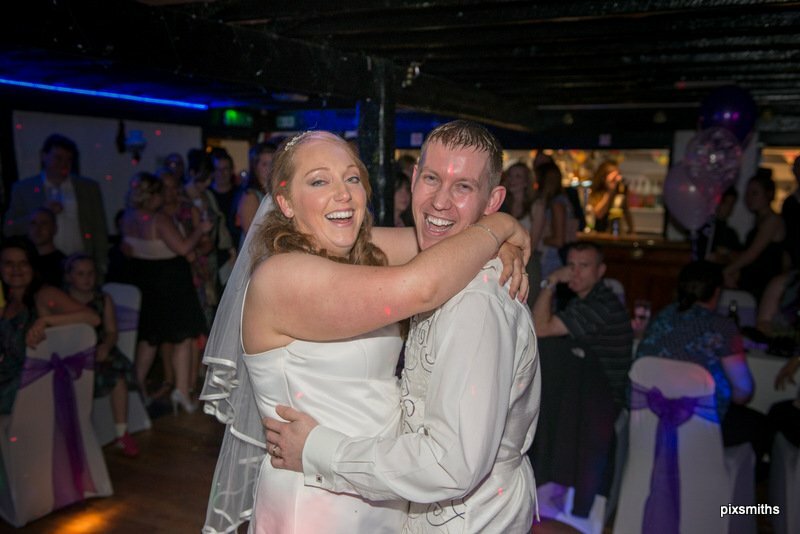 Many congratulations to David and Trudy, susch a fun loving couple, wishing you much future happiness and health. 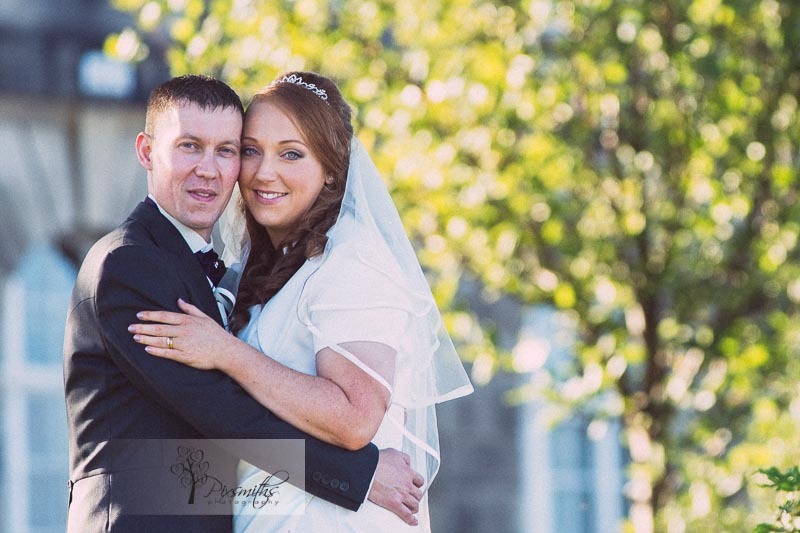 We were glad we could help them out and restore their faith in photographers, they are such a lovely couple and they should not have been in this situation. 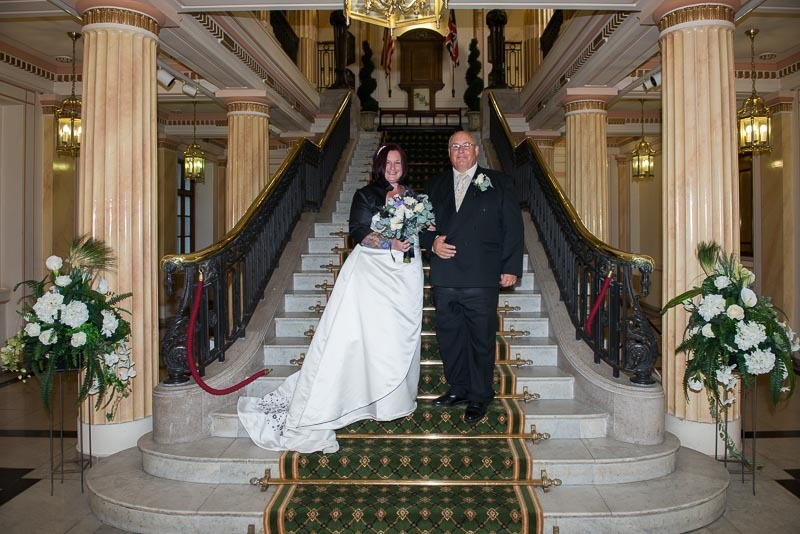 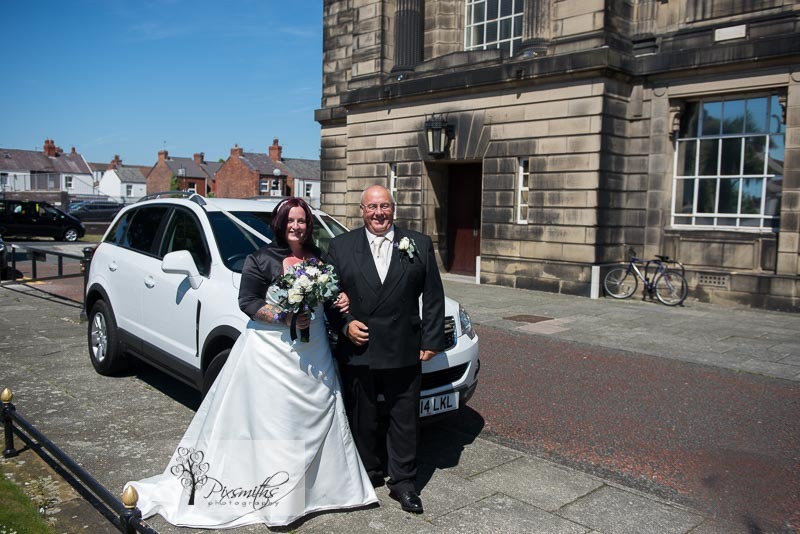 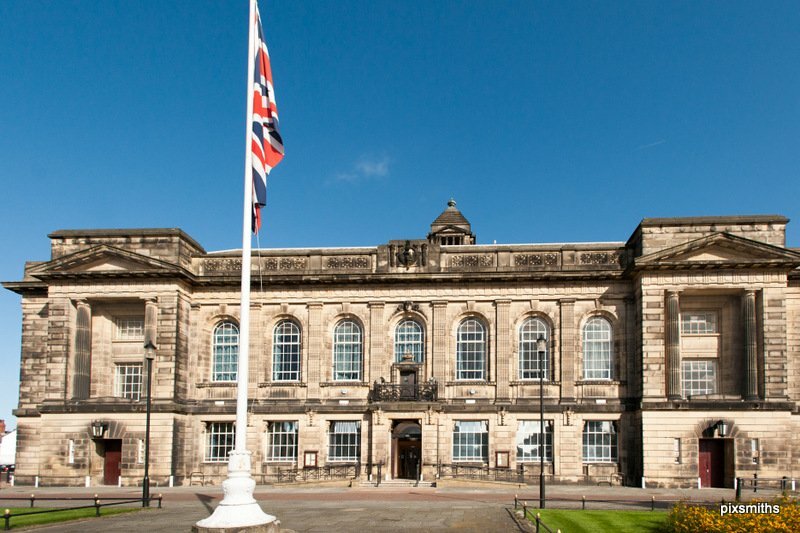 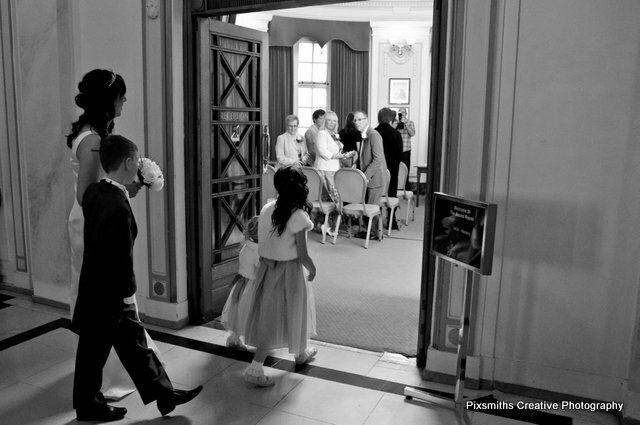 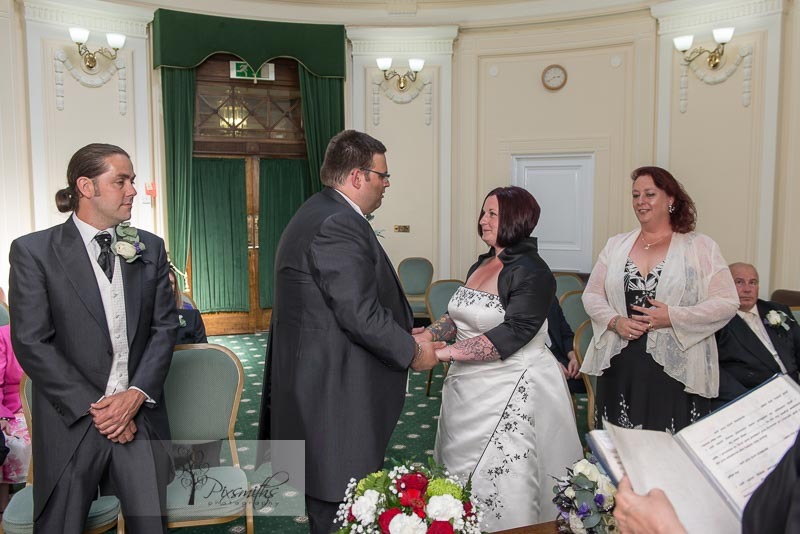 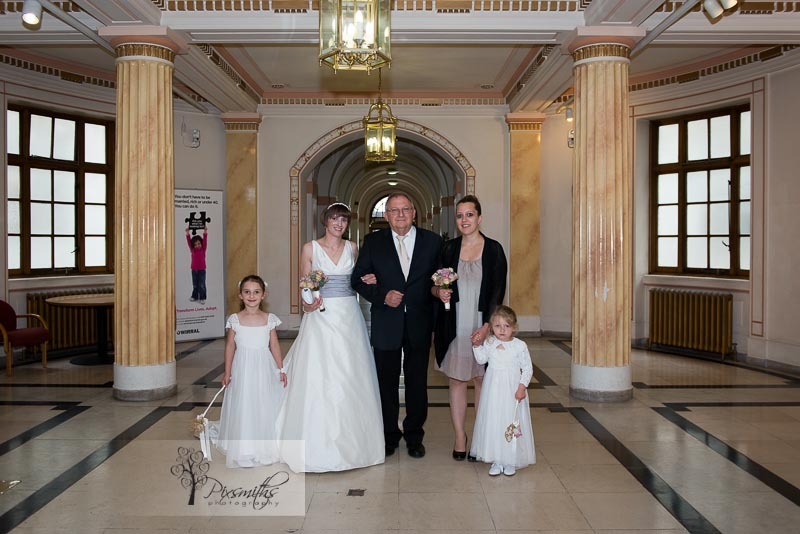 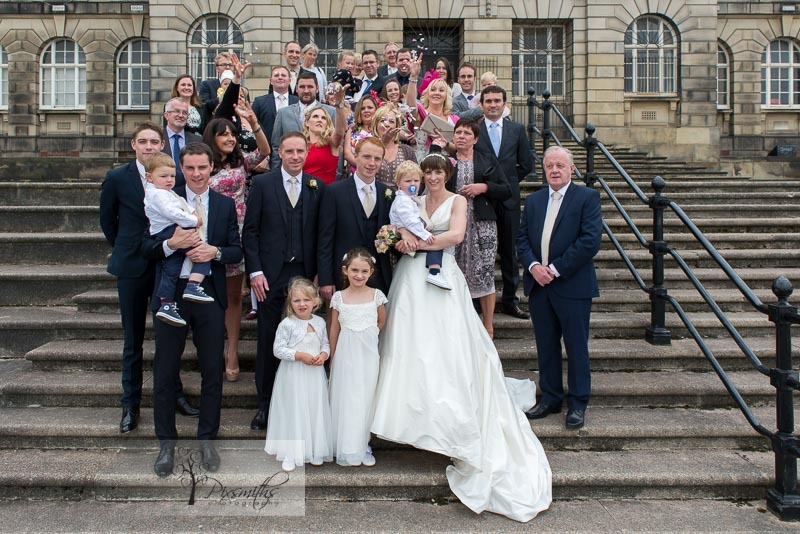 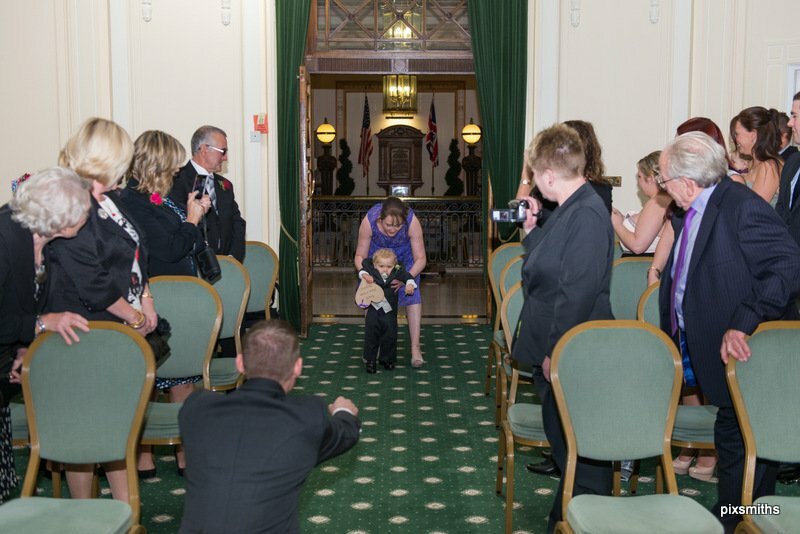 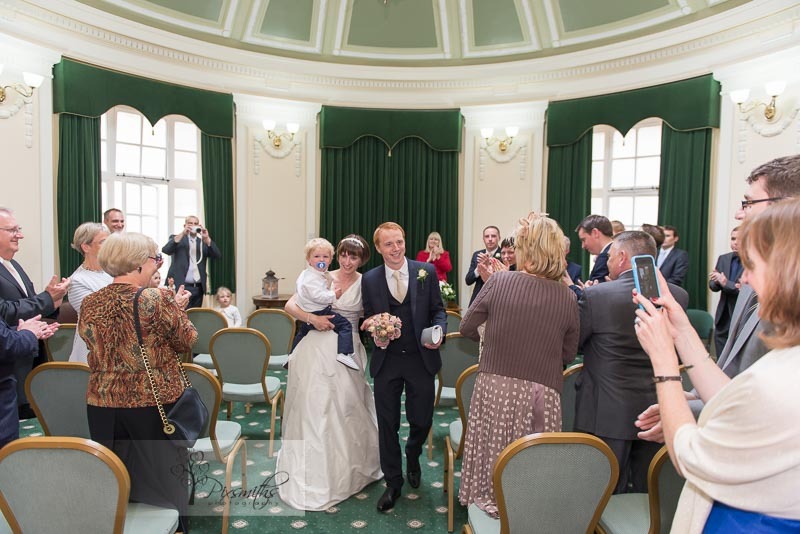 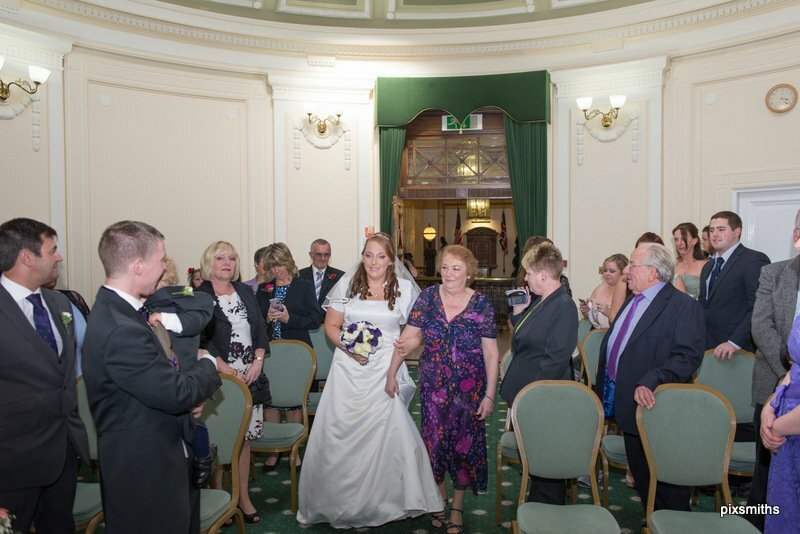 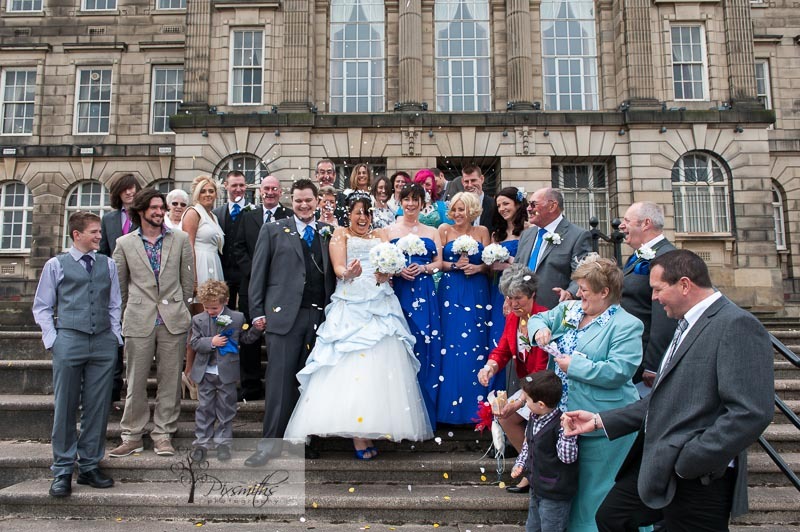 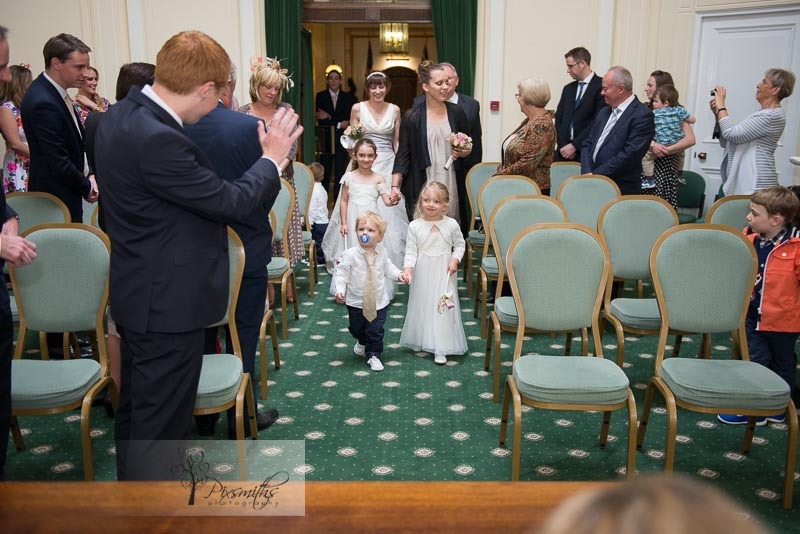 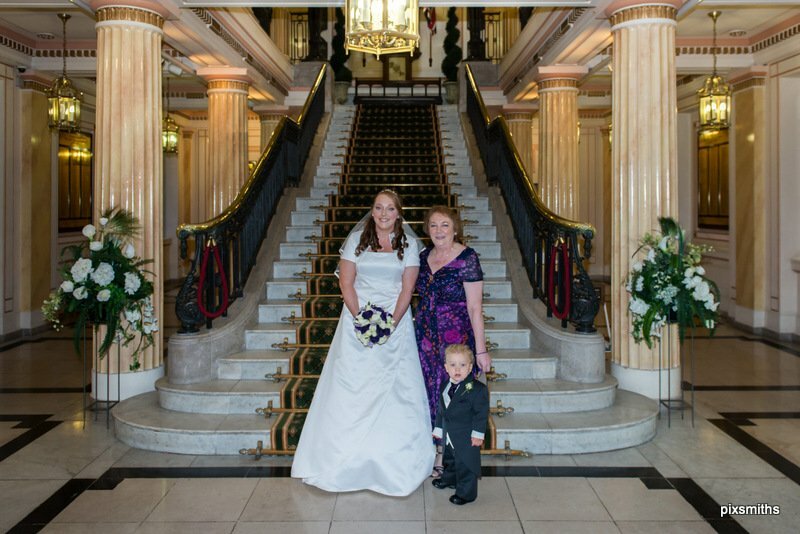 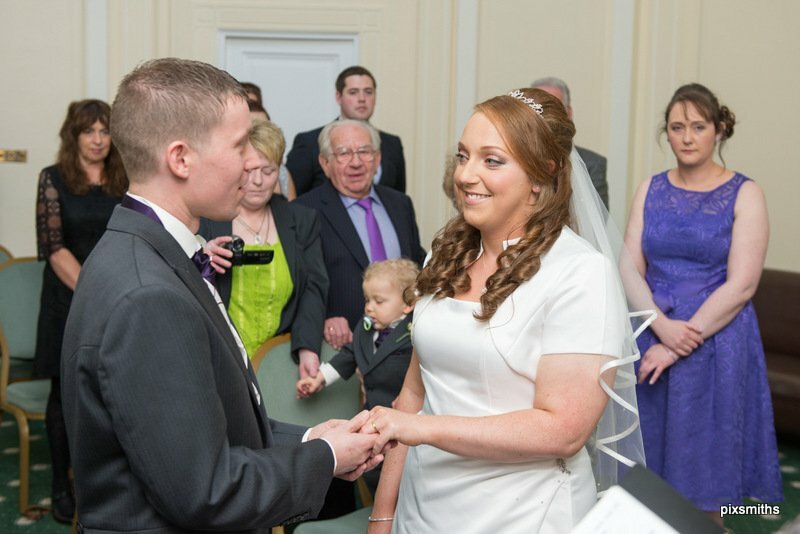 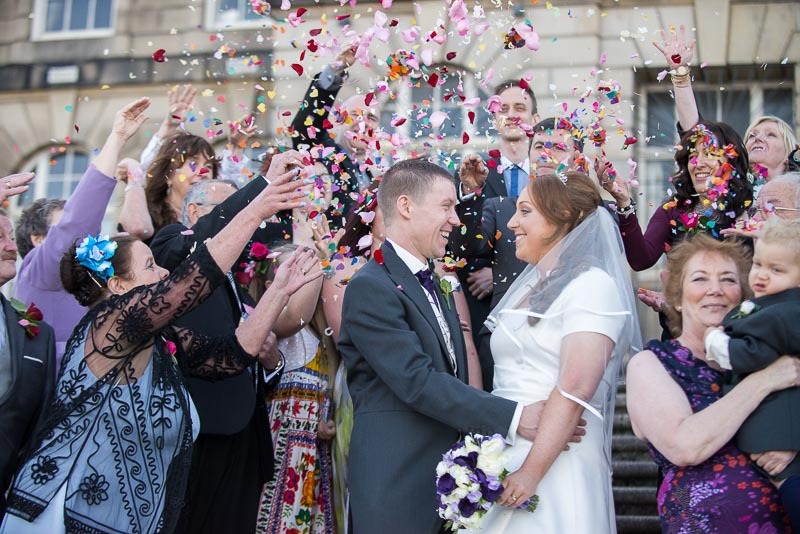 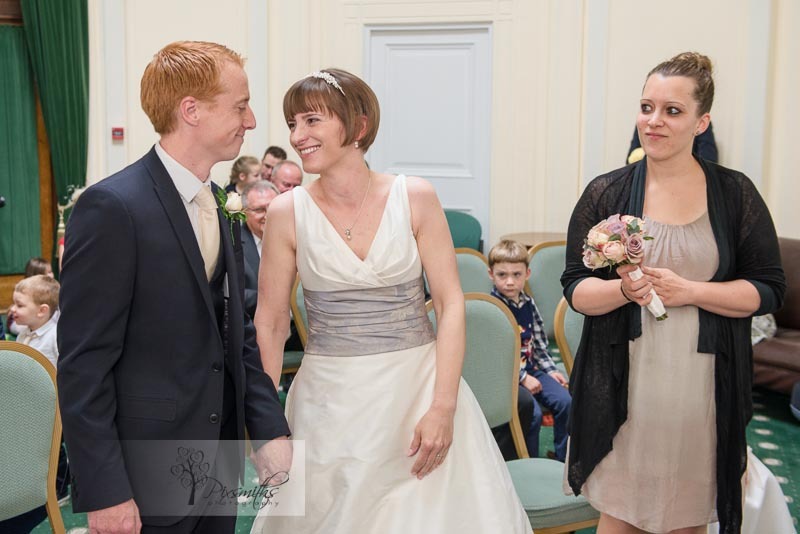 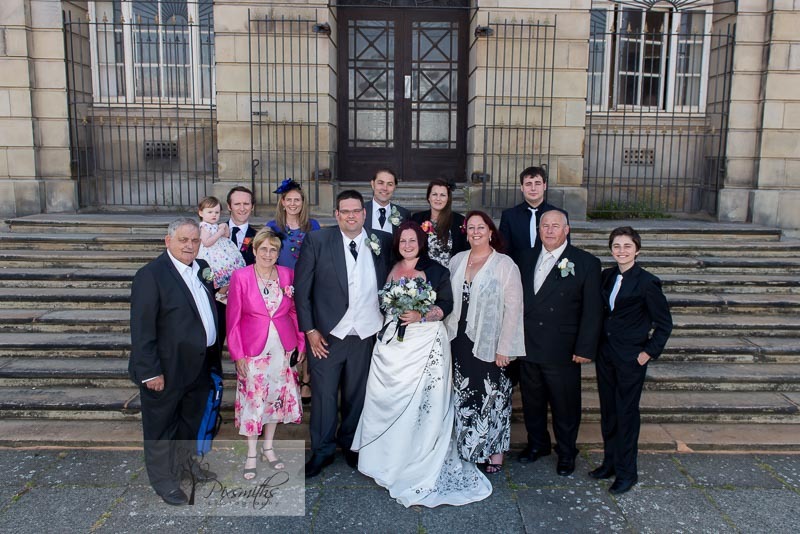 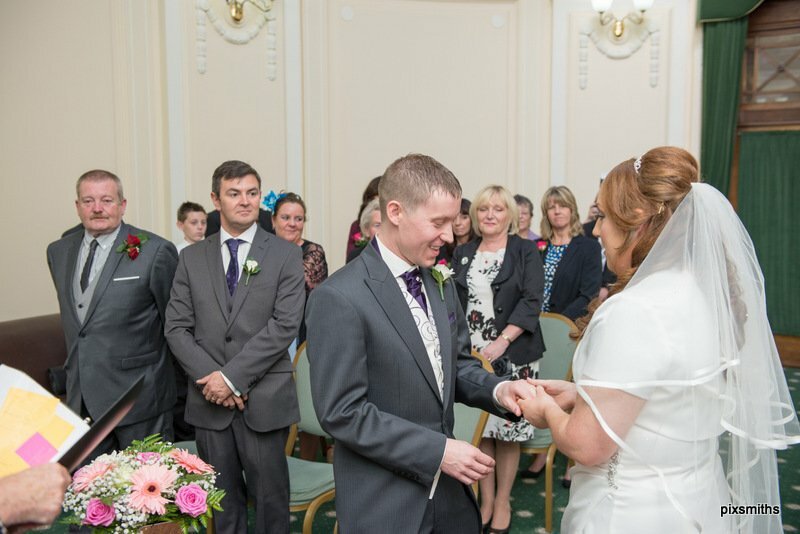 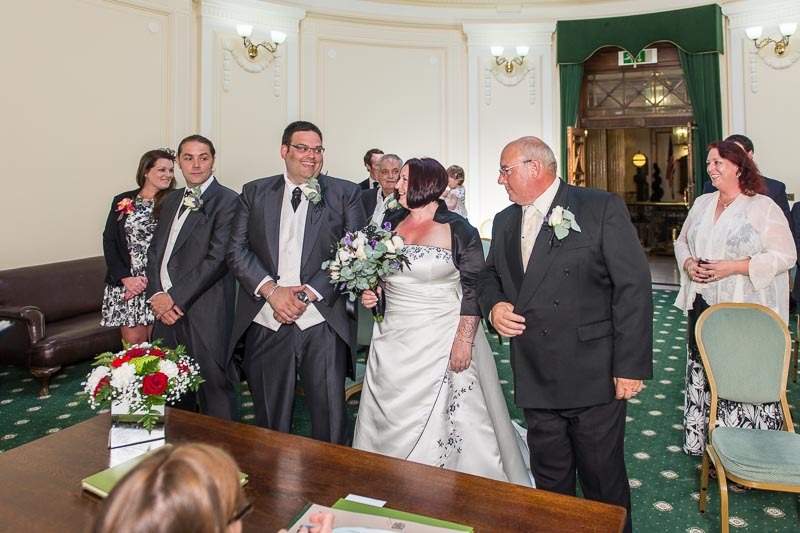 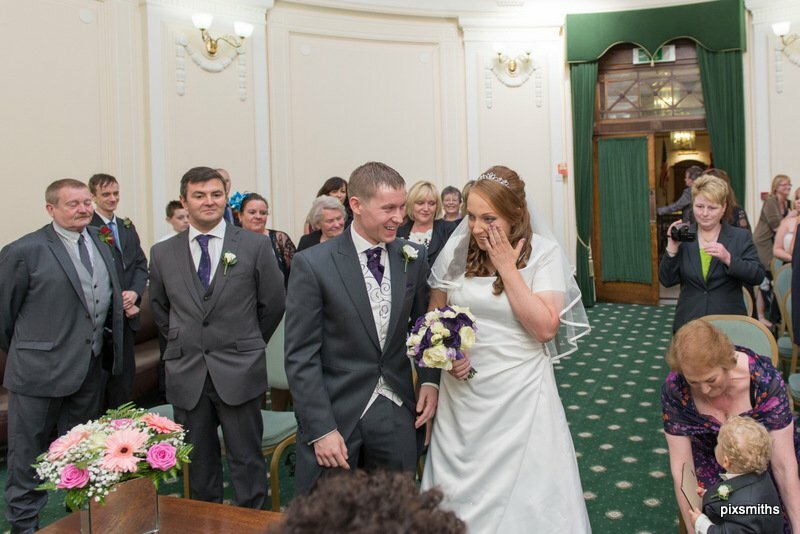 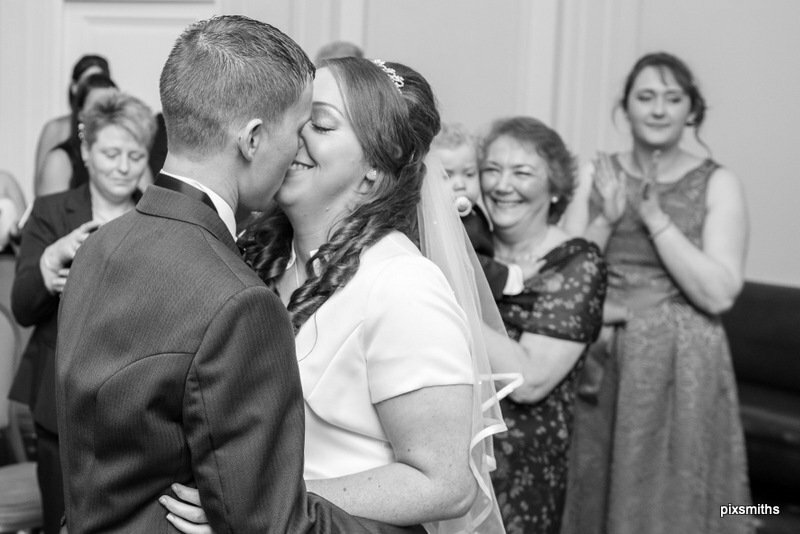 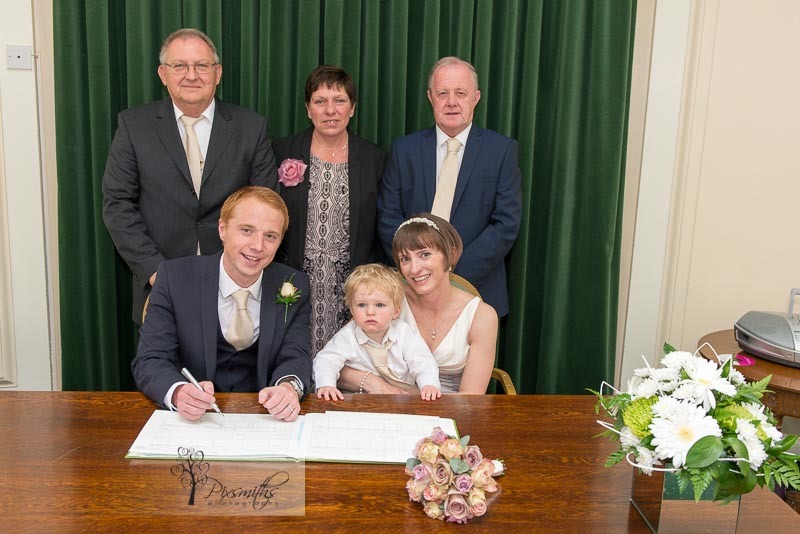 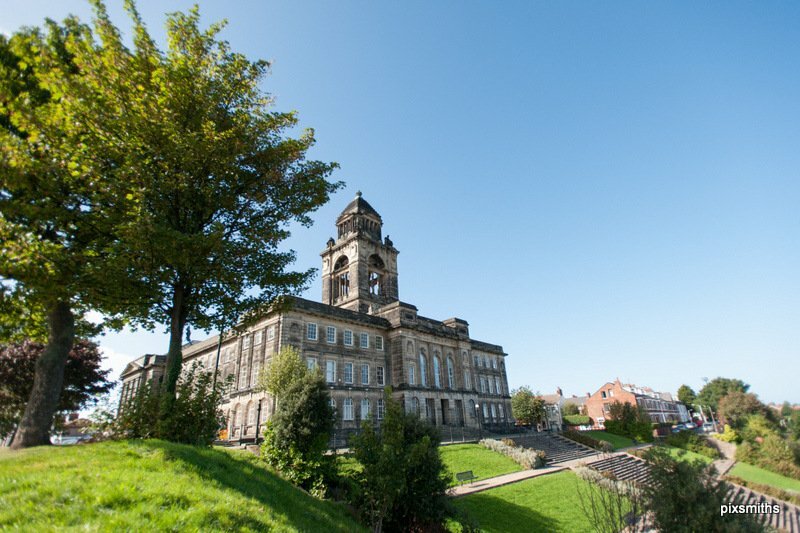 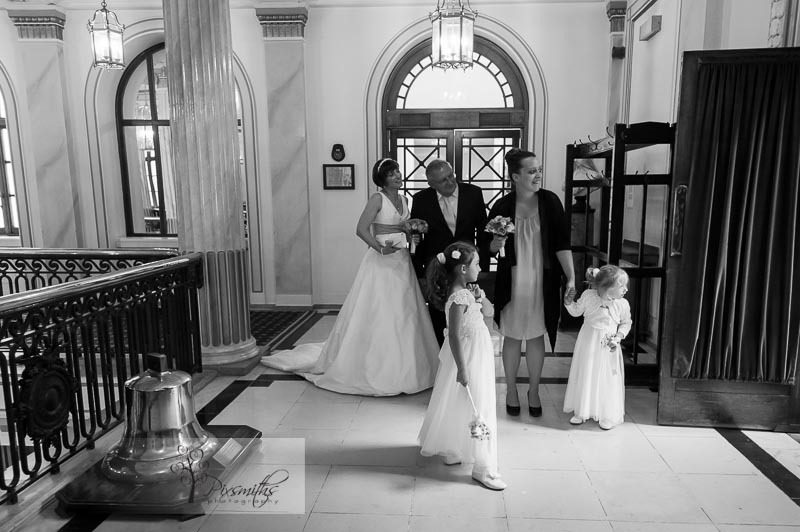 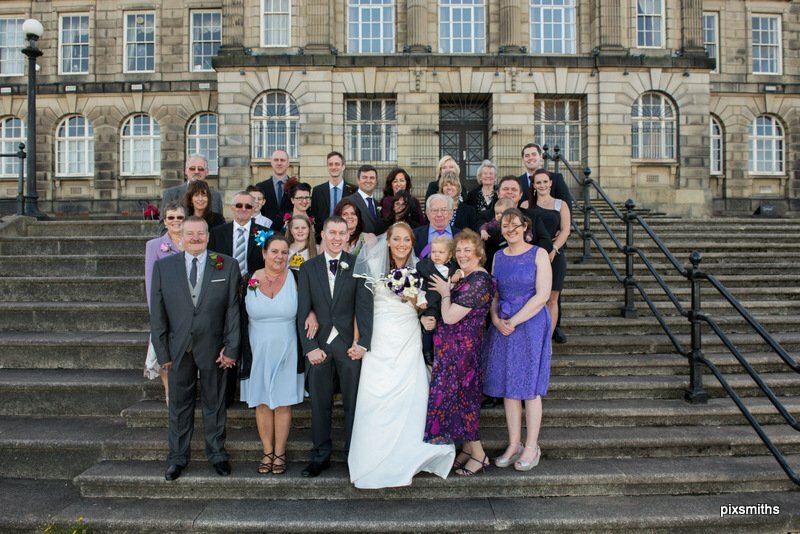 A civil ceremony at Wallasey Town Hall for their wedding was enjoyed by the respective families and children – many of Saski’s relatives had made the trip over from Germany. 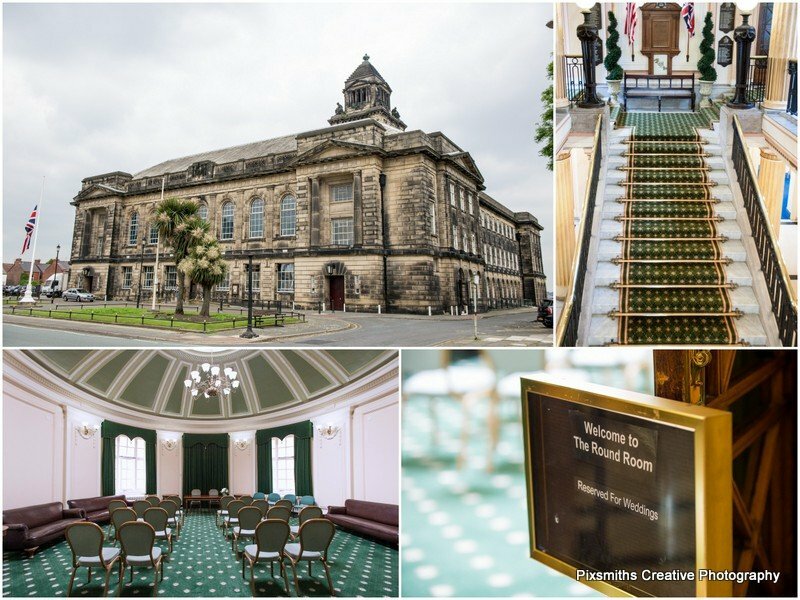 The Town Hall has recently been decorated and we love the new green colour scheme. 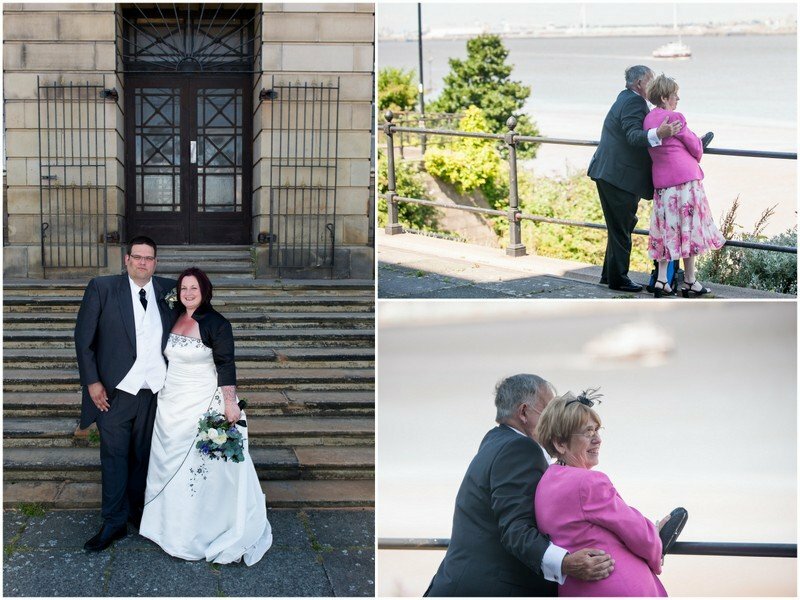 The stairs are always a feature inside an outside the steps overlooking the estuary always make for some great shots. 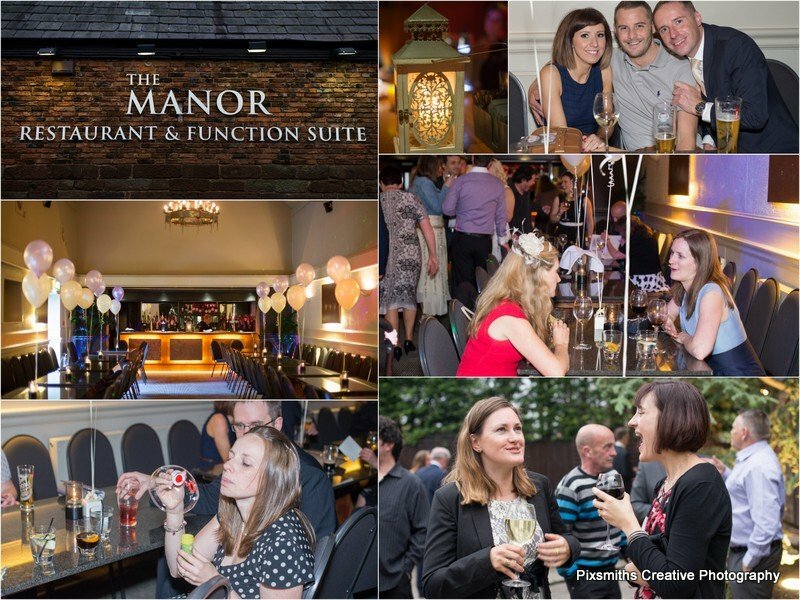 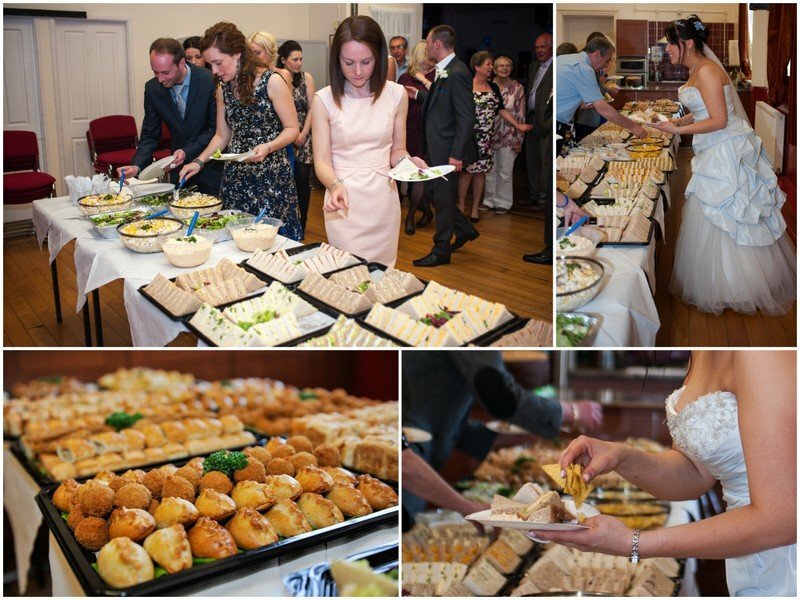 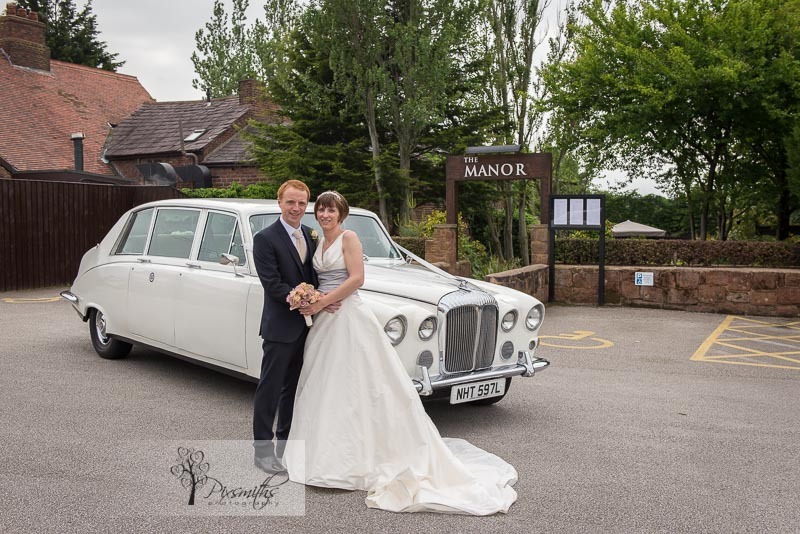 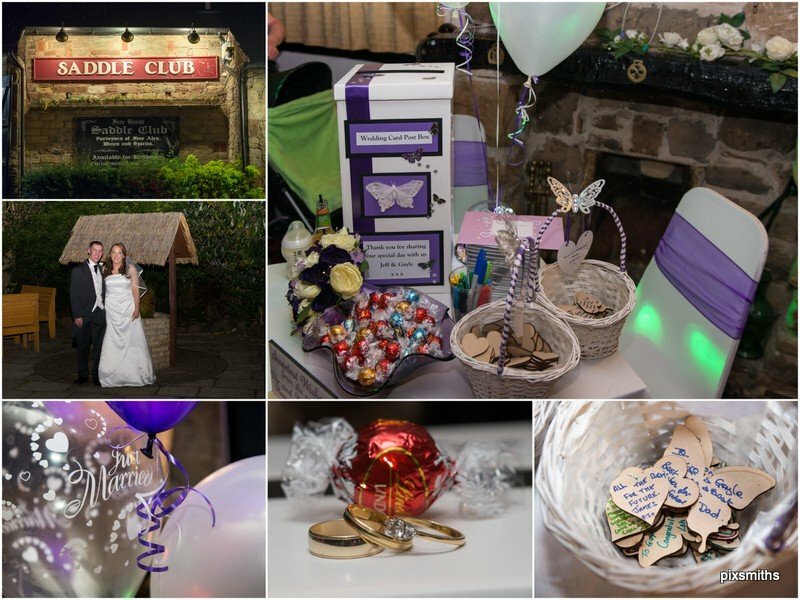 A reception was held at the The Manor in Greasby – always fabulous food and service there – in the barn function room. 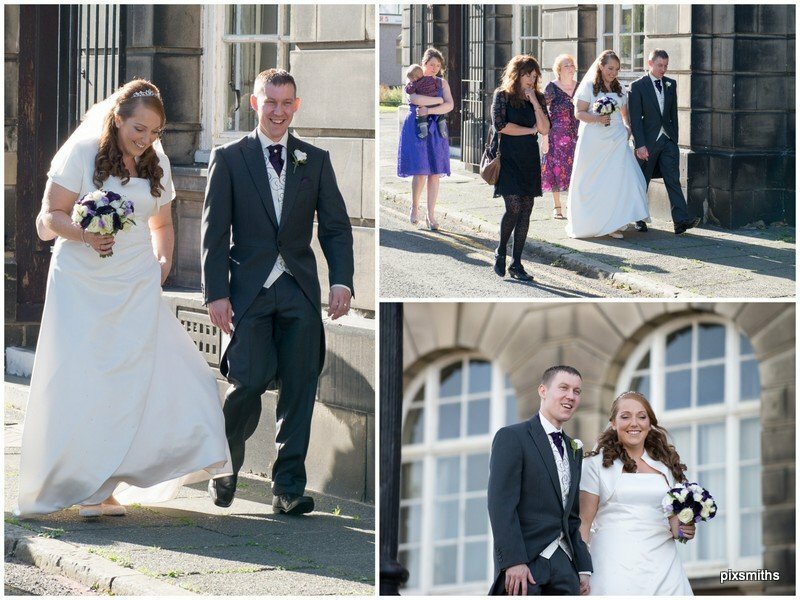 The weather was warm enough for people to mingle in the courtyard garden outside. 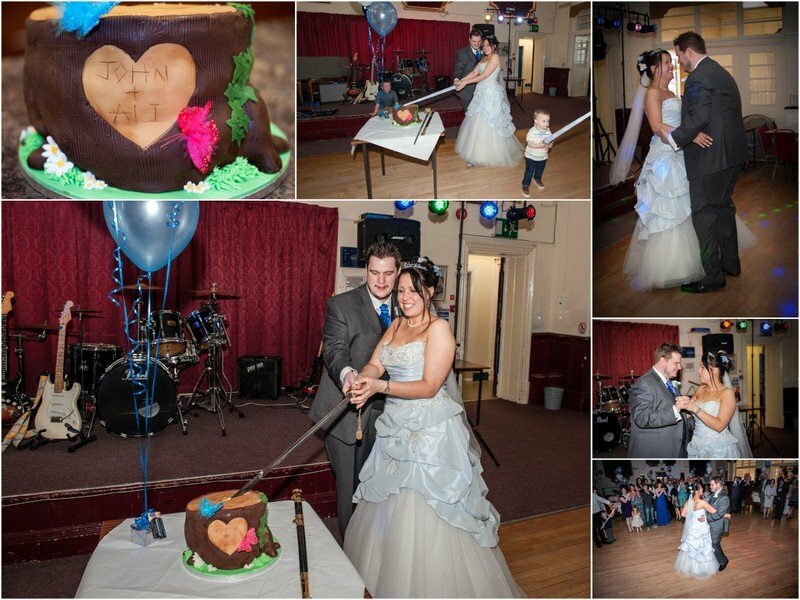 We got some shots of the room and a cake cut shot before leaving them to enjoy their meal….and then surprised them by coming back in the evening to capture some dance shots. 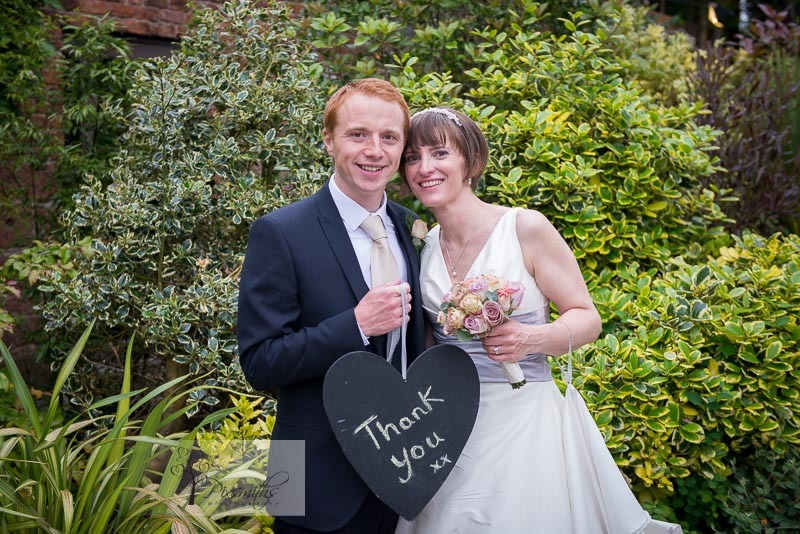 Being just a short distance away we wanted to do something for this lovely couple after they had lost their deposit. 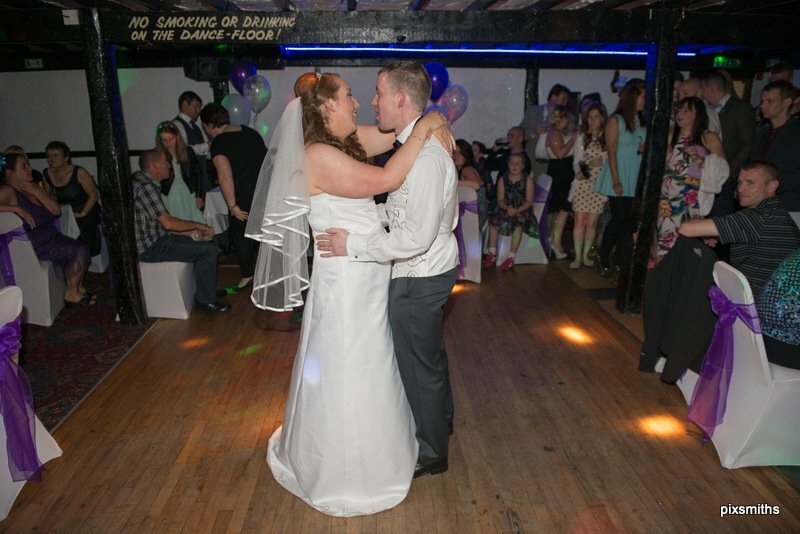 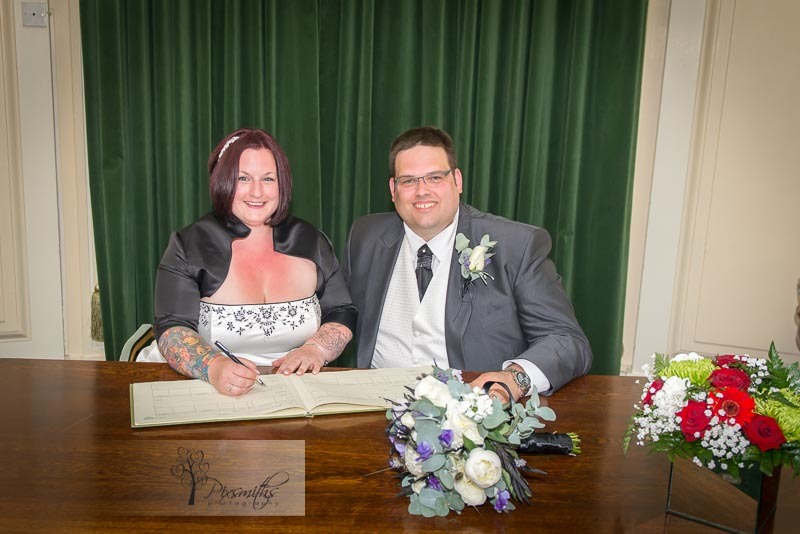 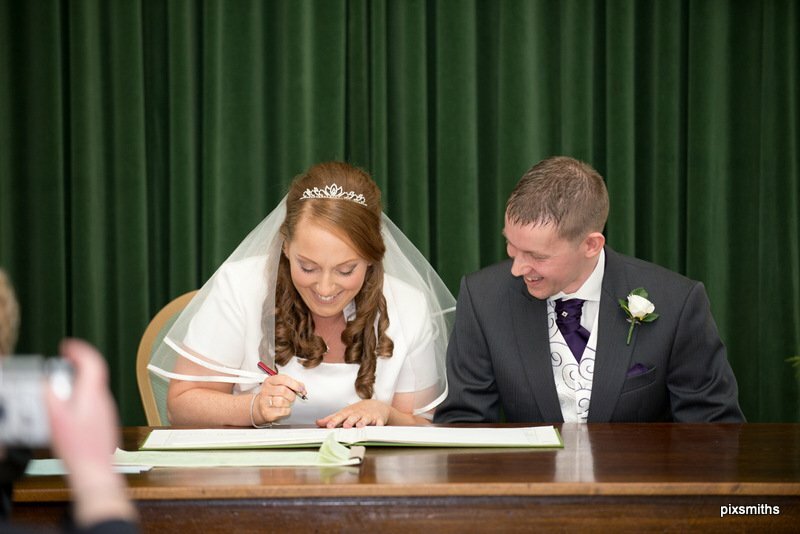 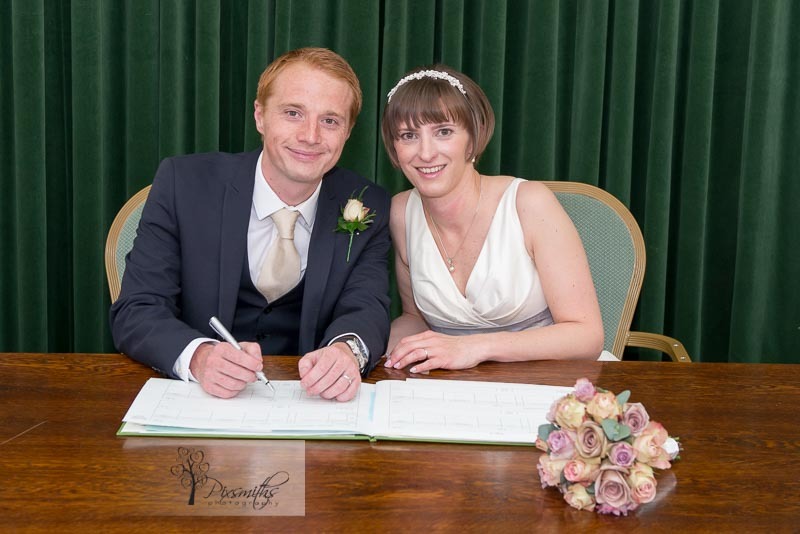 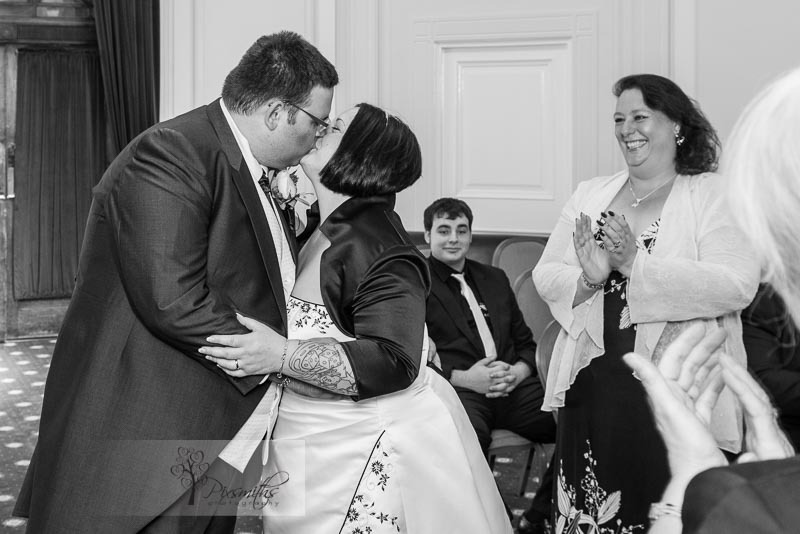 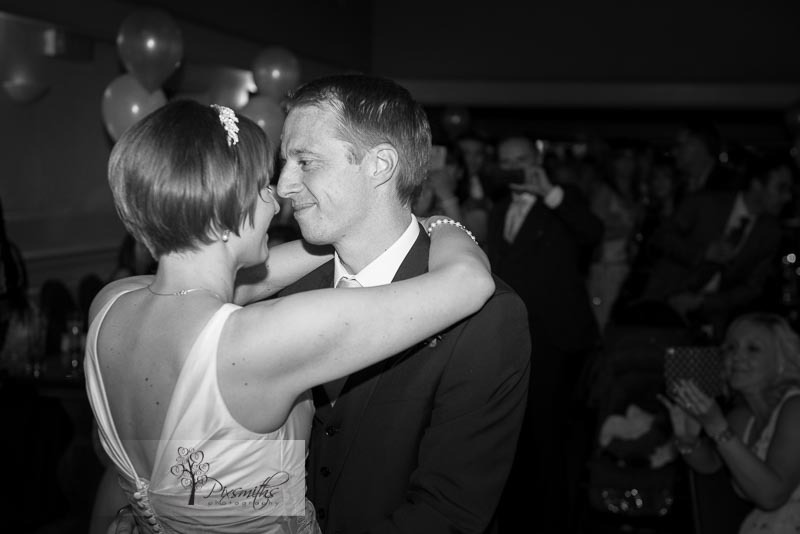 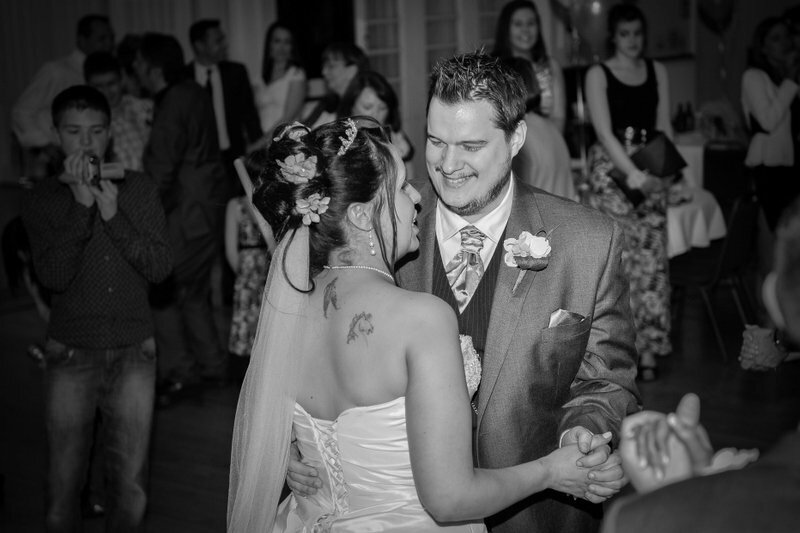 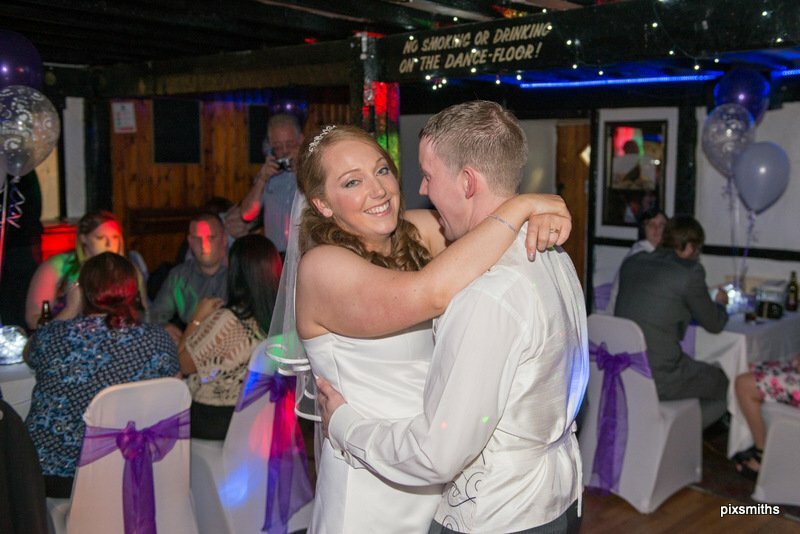 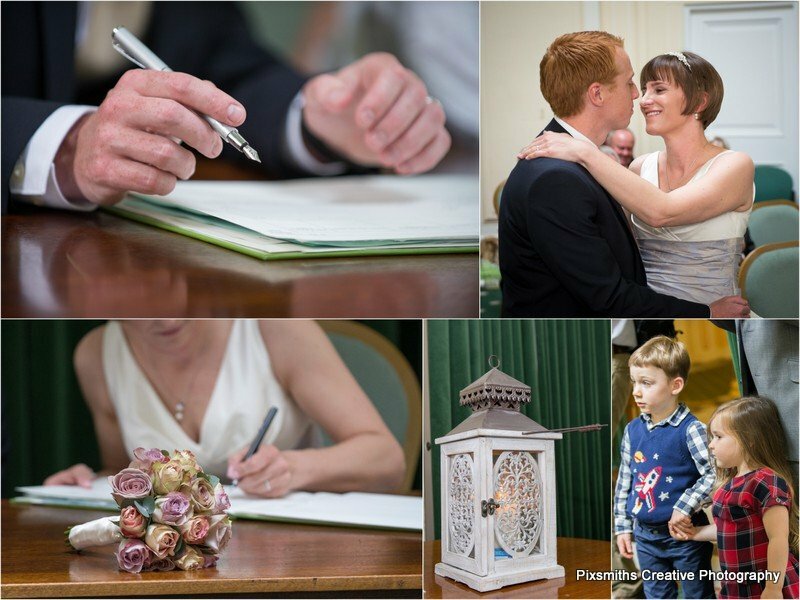 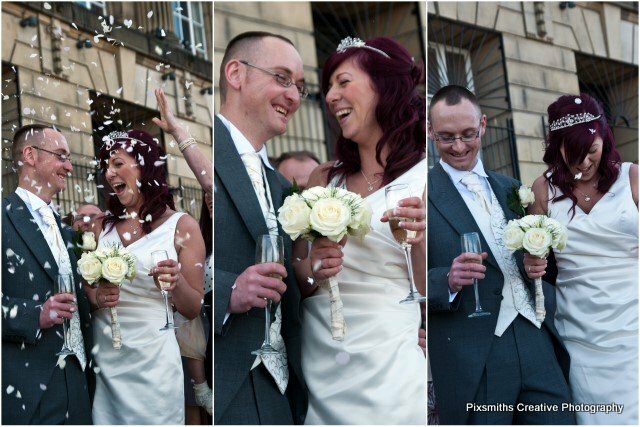 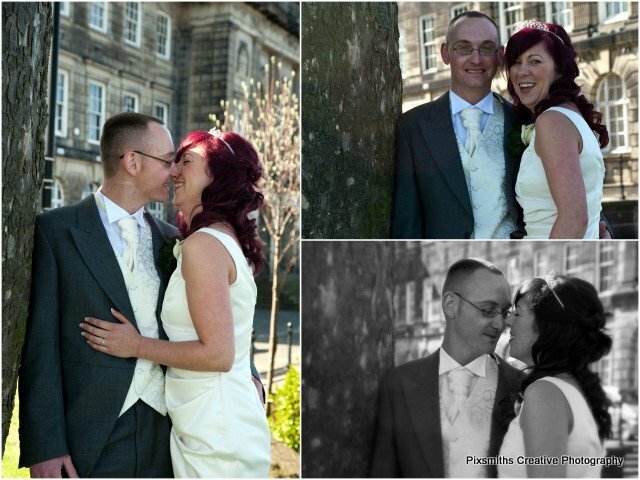 They were so happy and we have now designed them a beautiful album to preserve their memories. 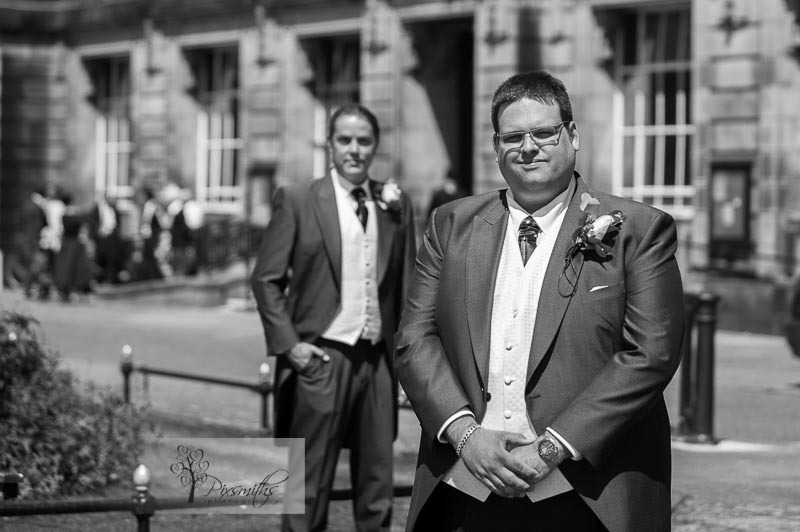 Here a few highlights from the day to enjoy – showing a good example of posed and candid, reportage style shots we like to take. 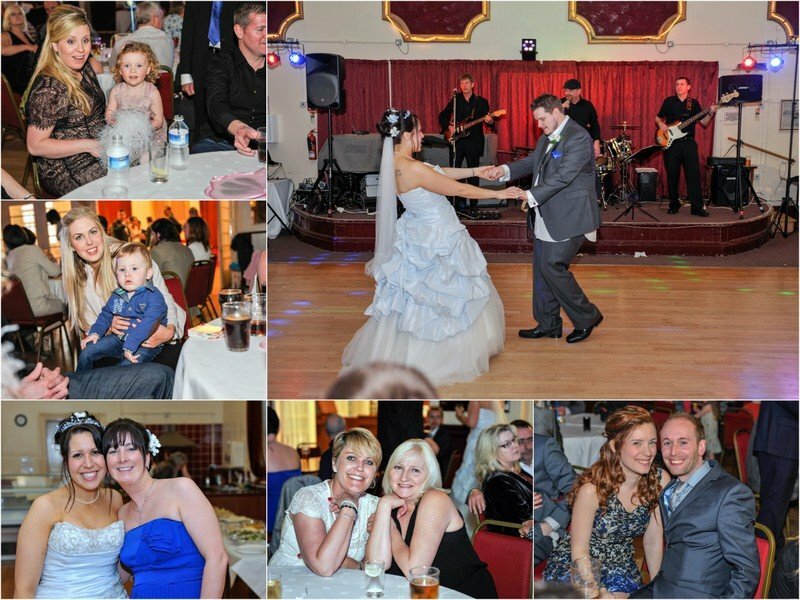 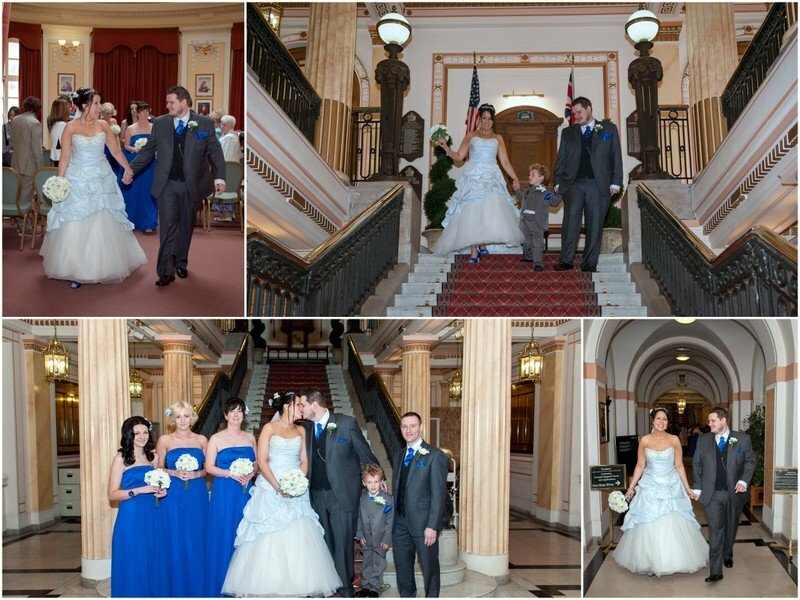 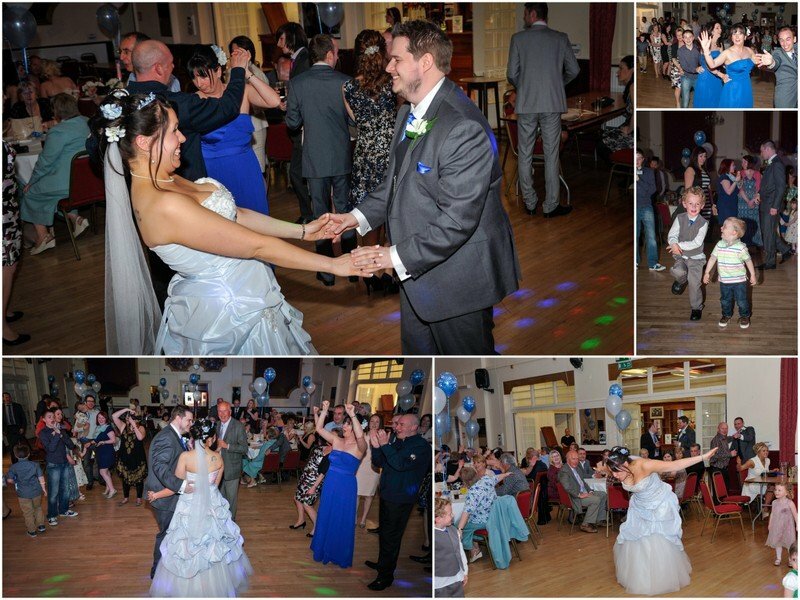 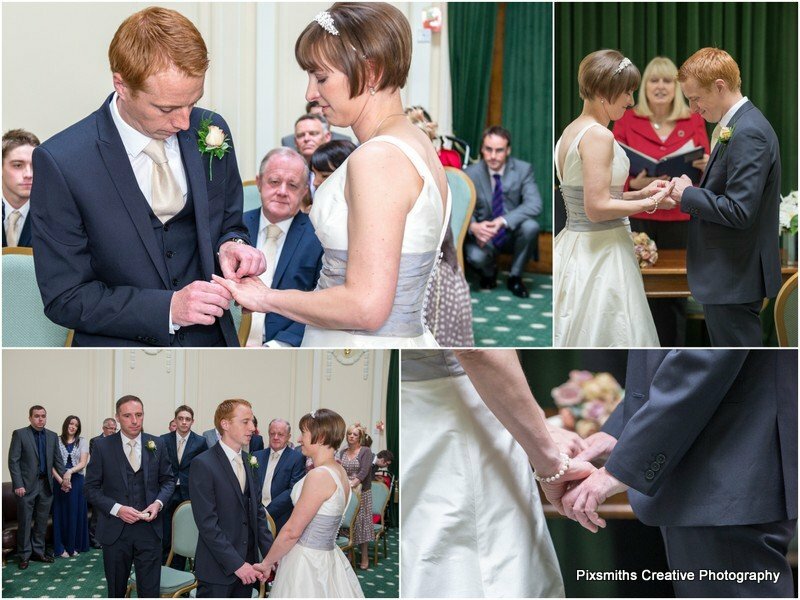 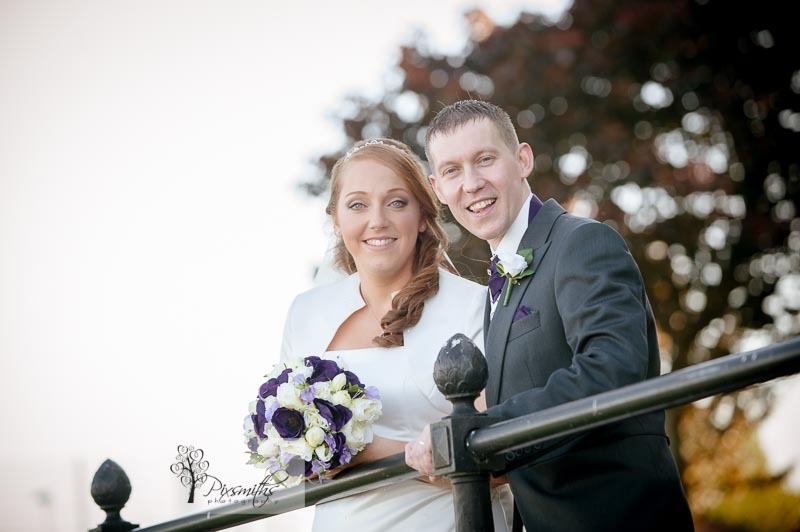 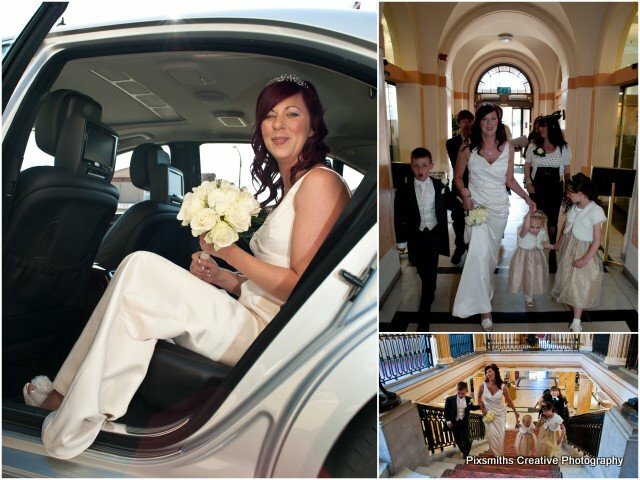 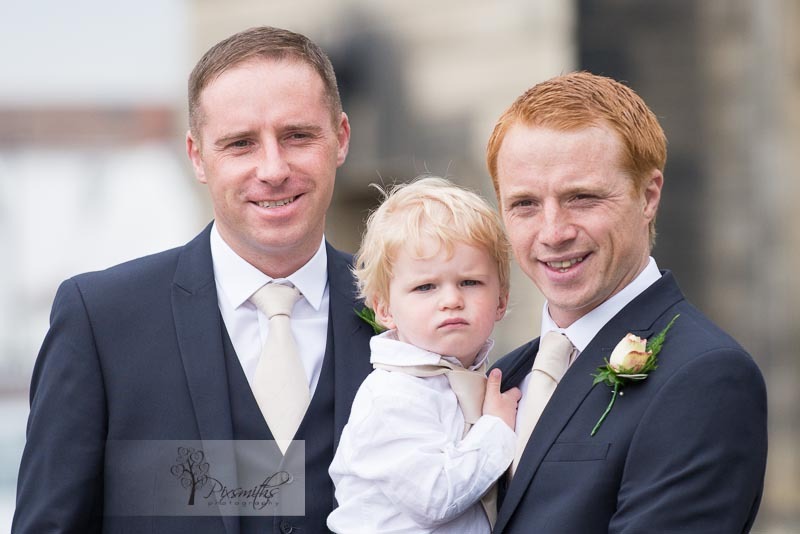 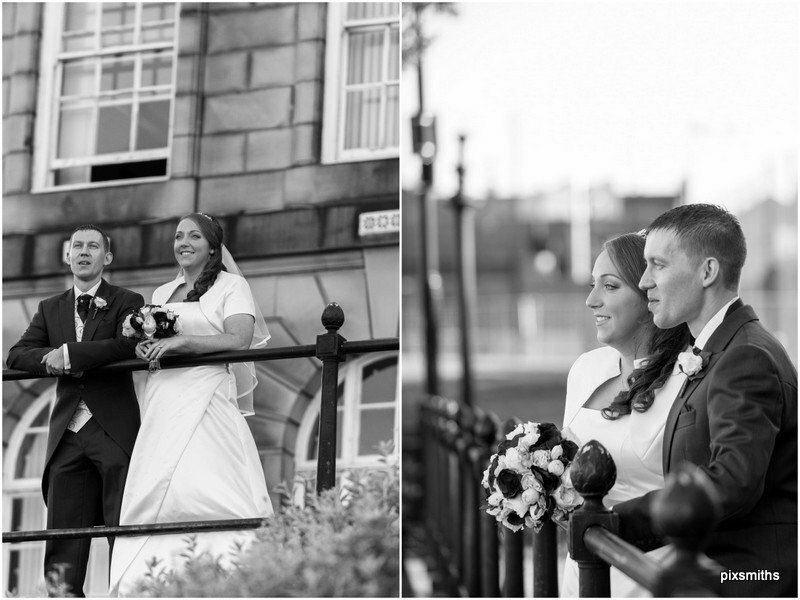 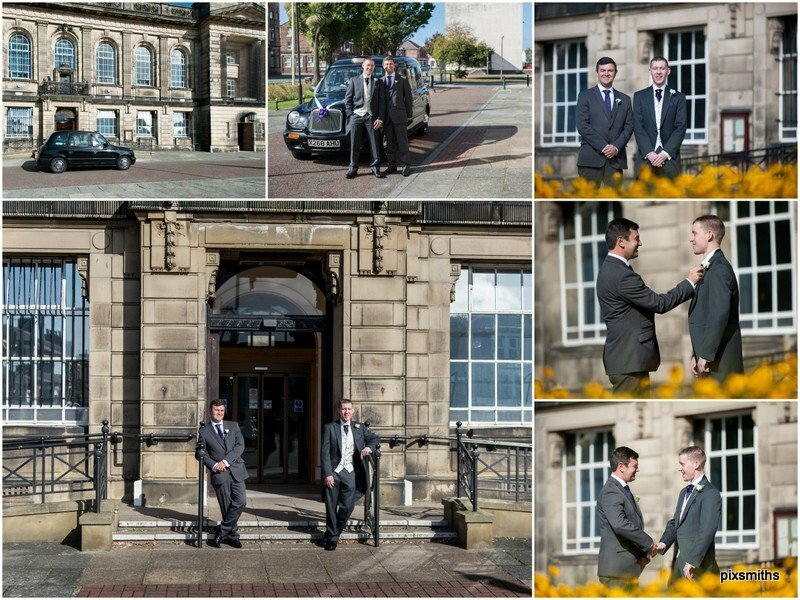 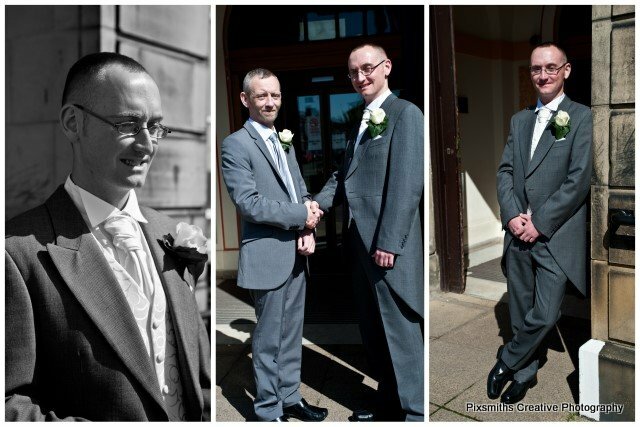 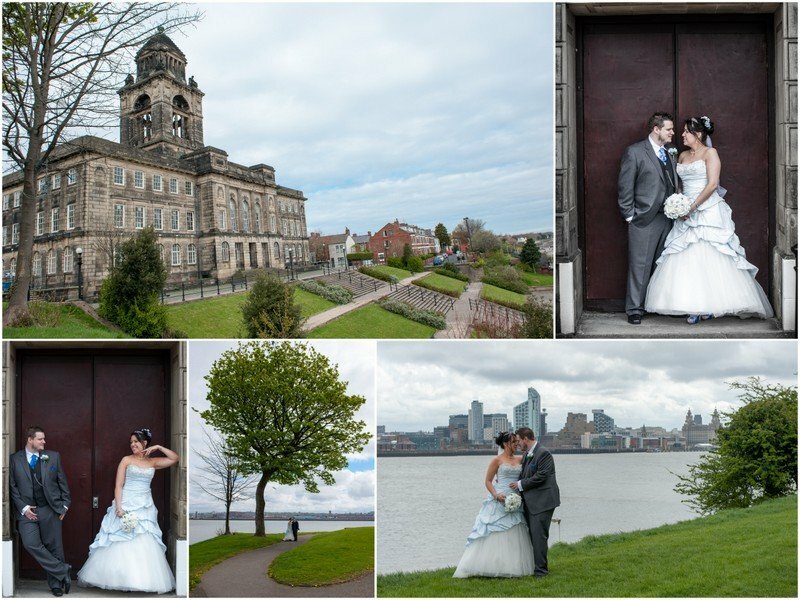 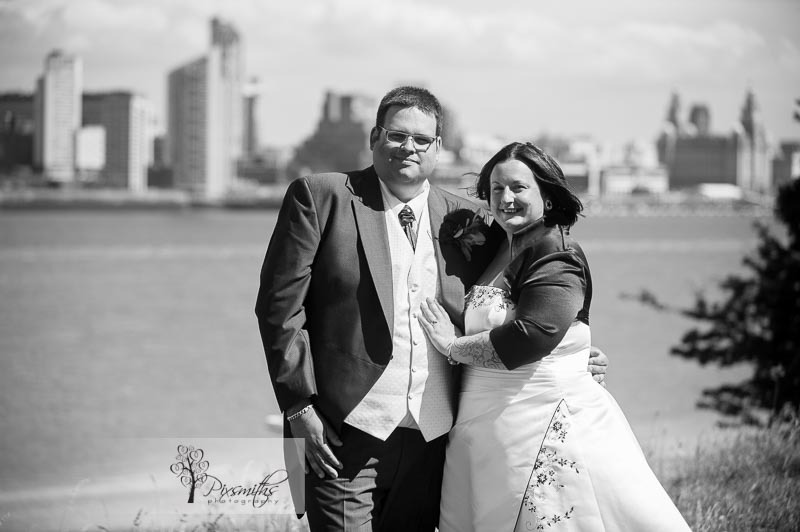 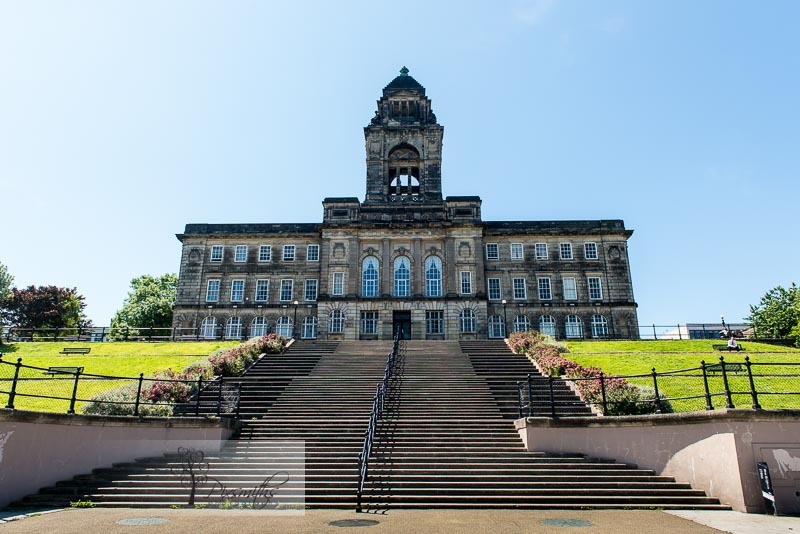 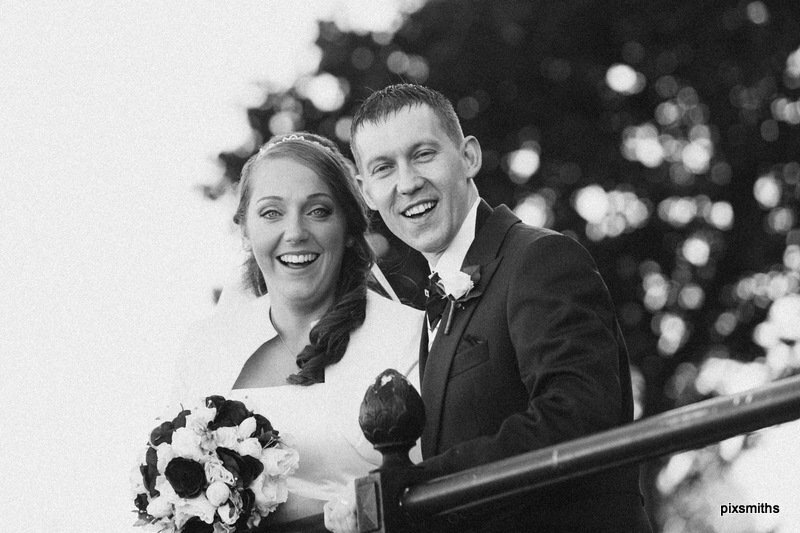 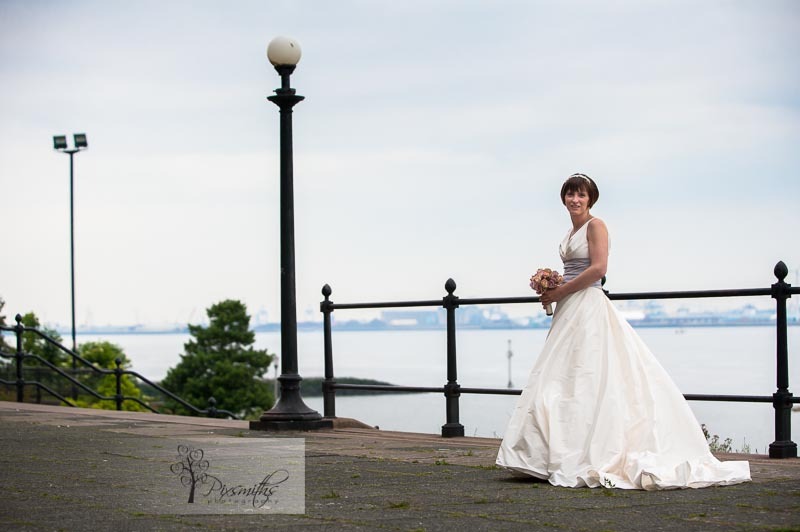 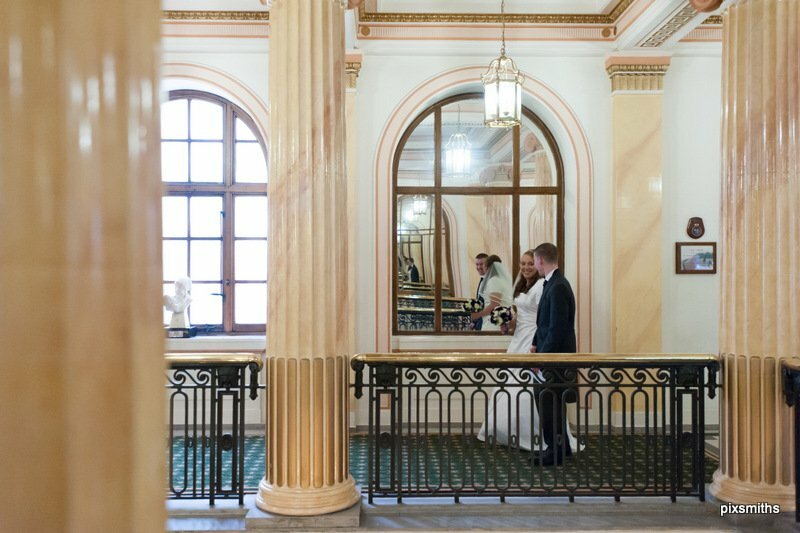 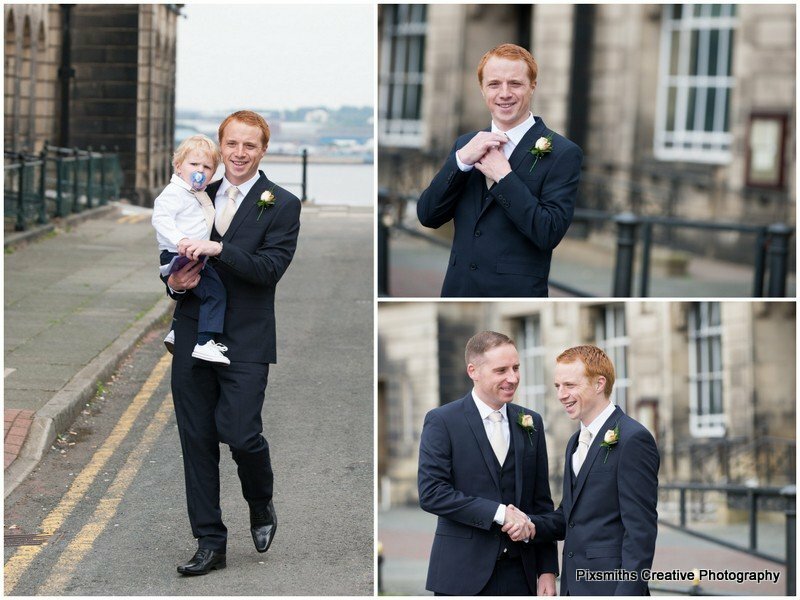 Pixsmiths have covered several Wallasey Town Hall weddings – often offering short coverage to couples who don’t need extensive covarage but really appreciate having professional images captured for them. 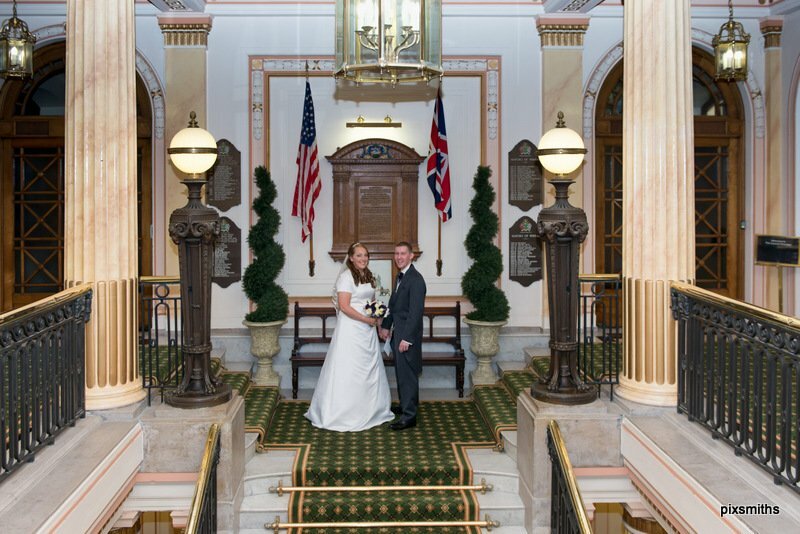 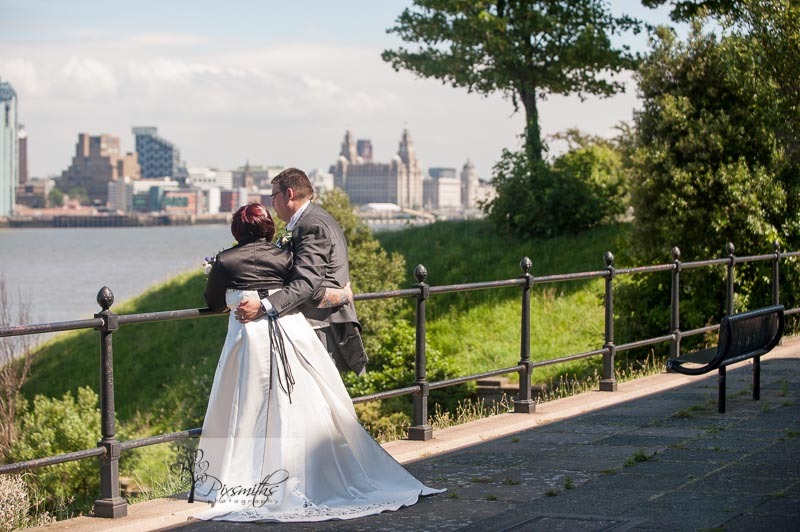 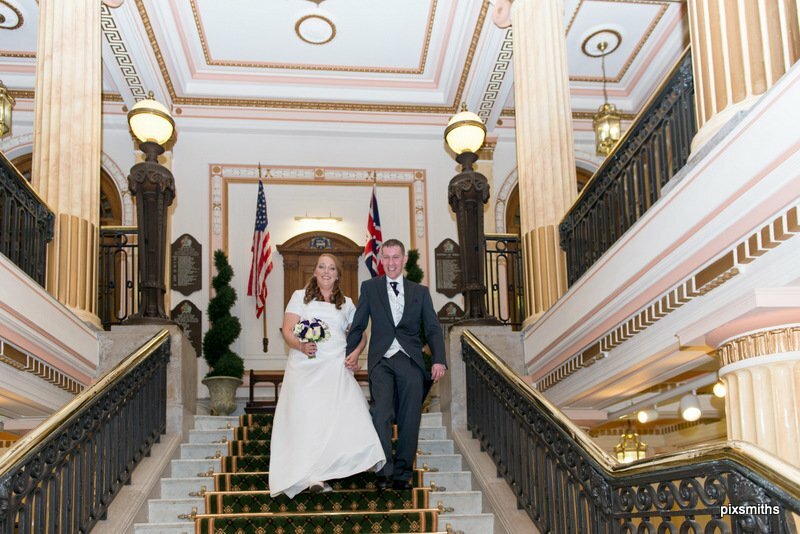 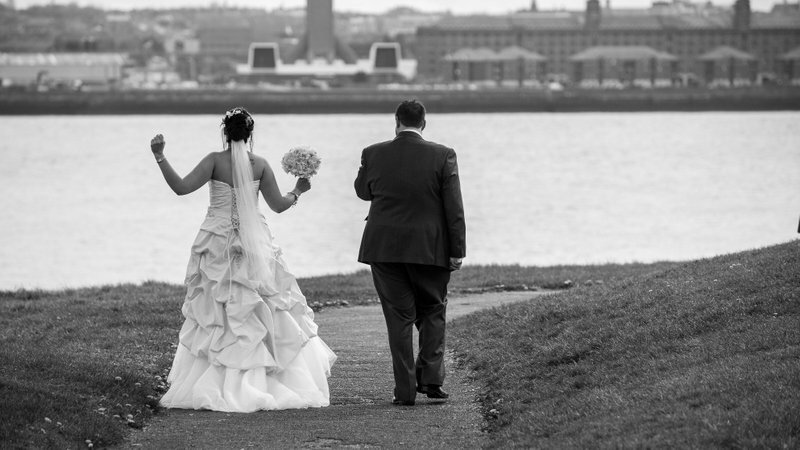 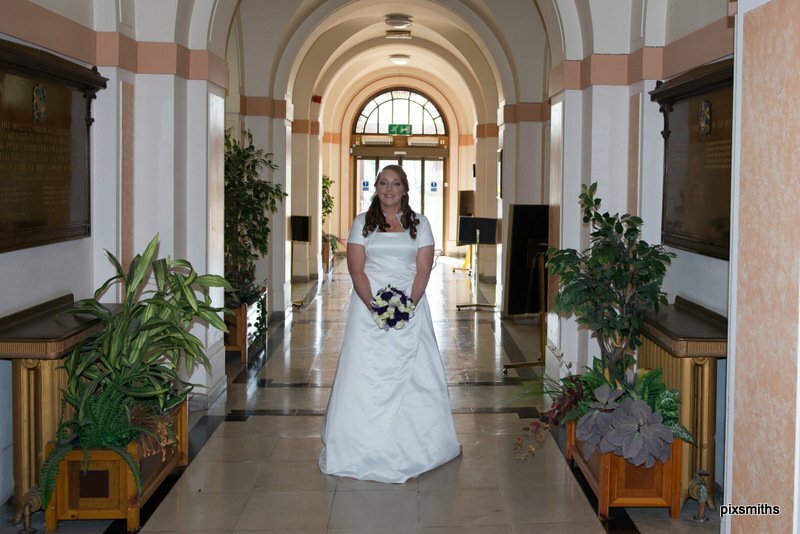 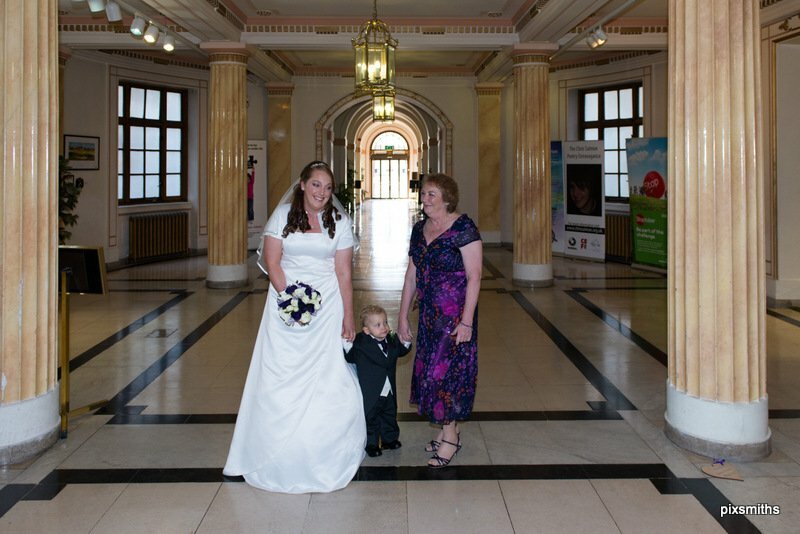 Contact us for our special offers for Town Hall weddings at Birkenhead or Wallasey. 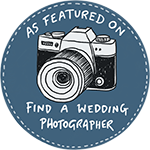 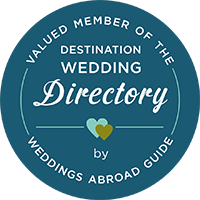 You may be surprised at how little it can cost – even 90 minute coverage for ceremony to shots afterwards are available for as little as £175. 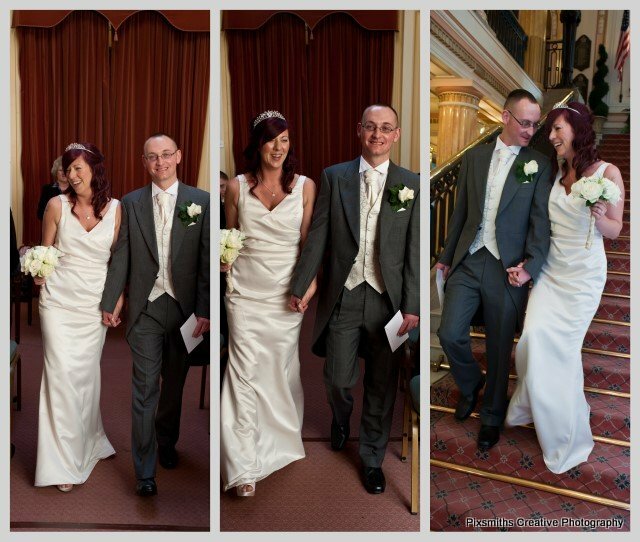 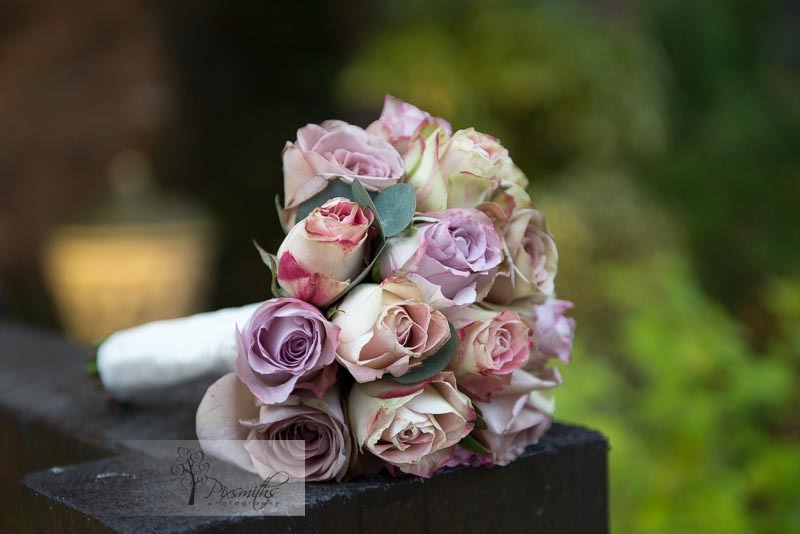 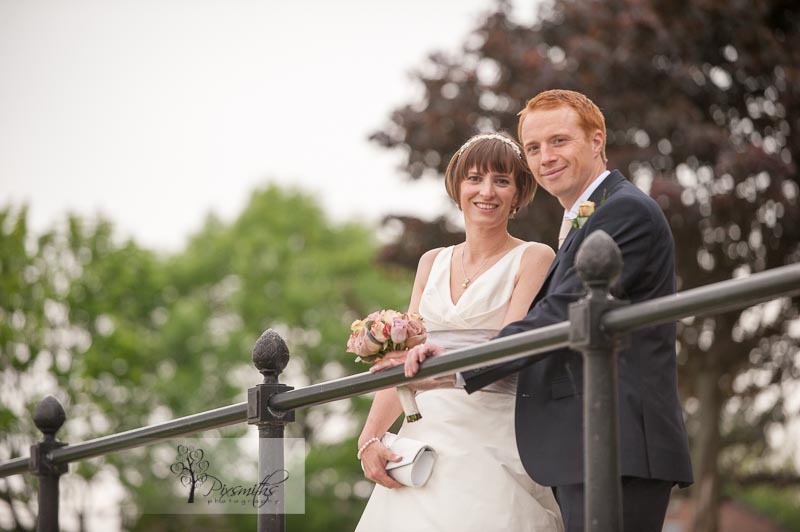 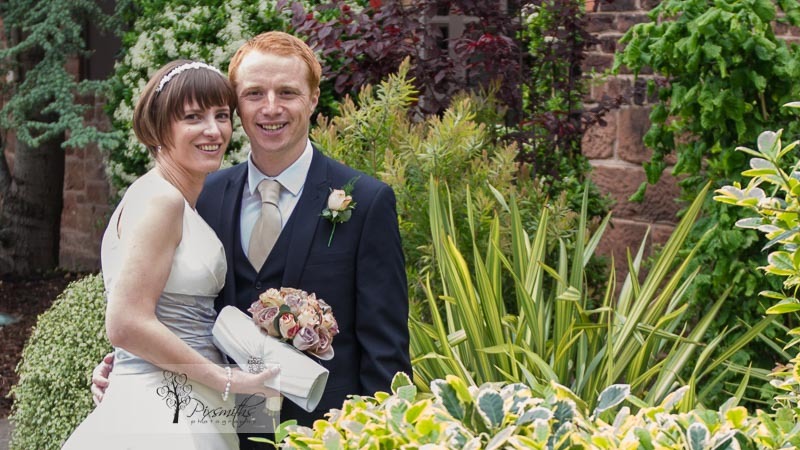 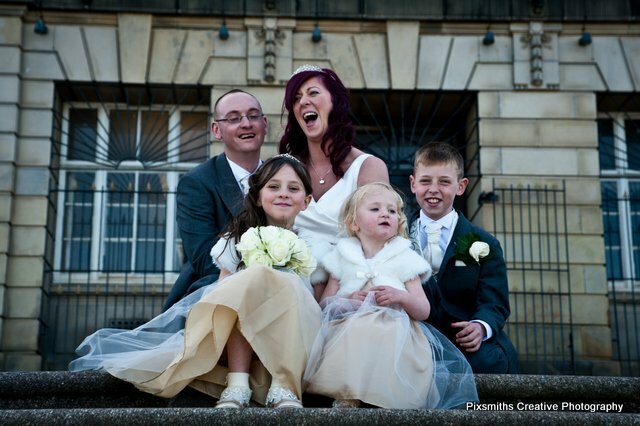 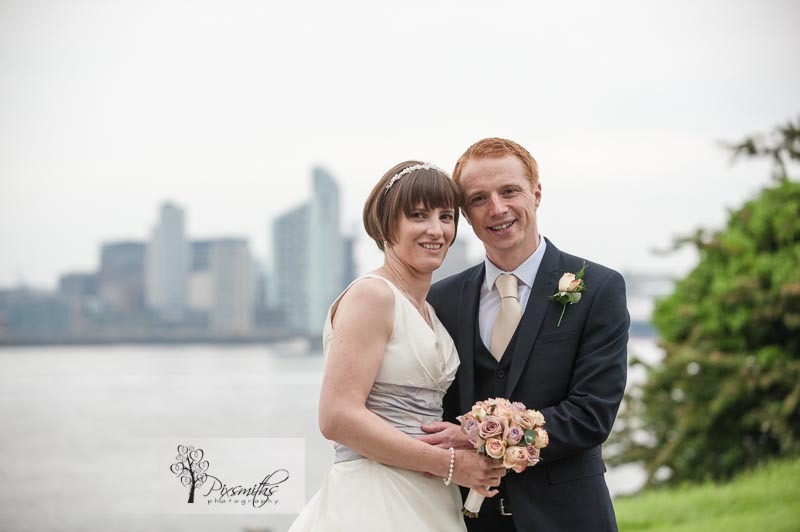 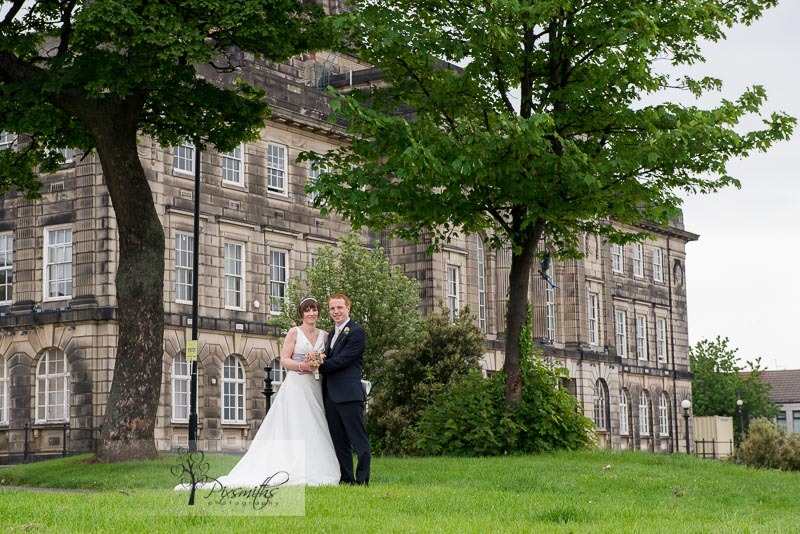 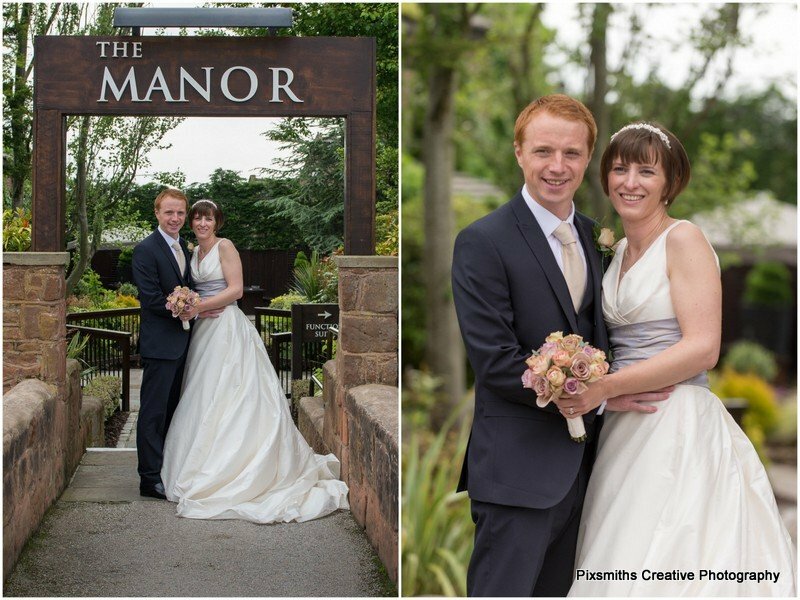 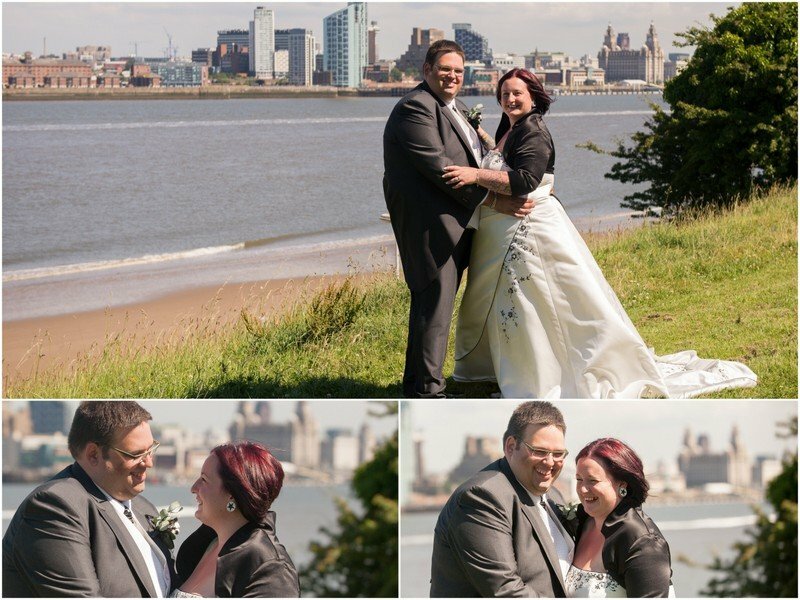 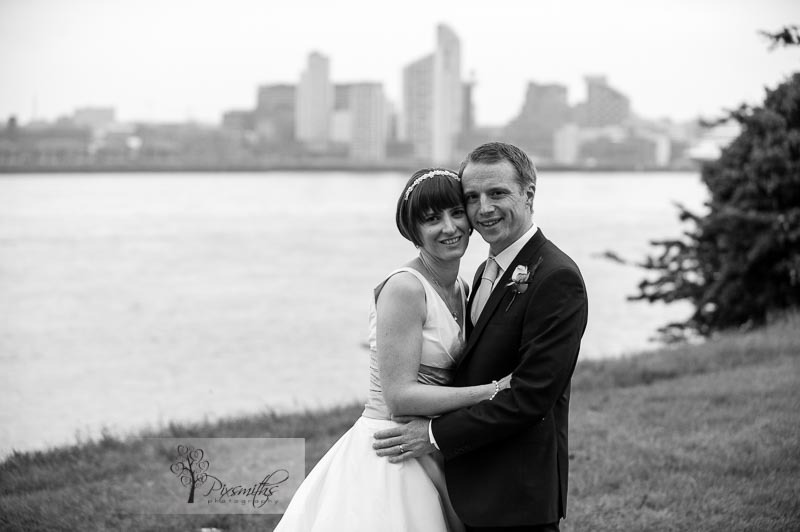 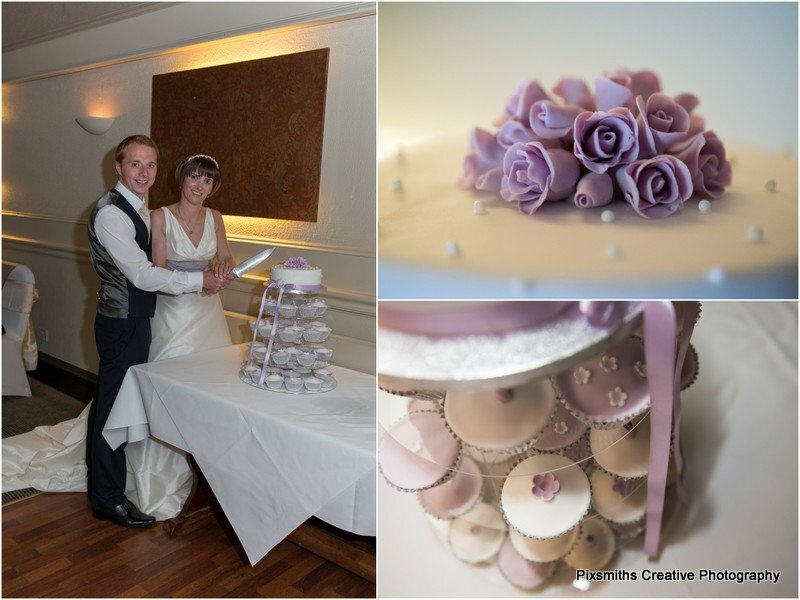 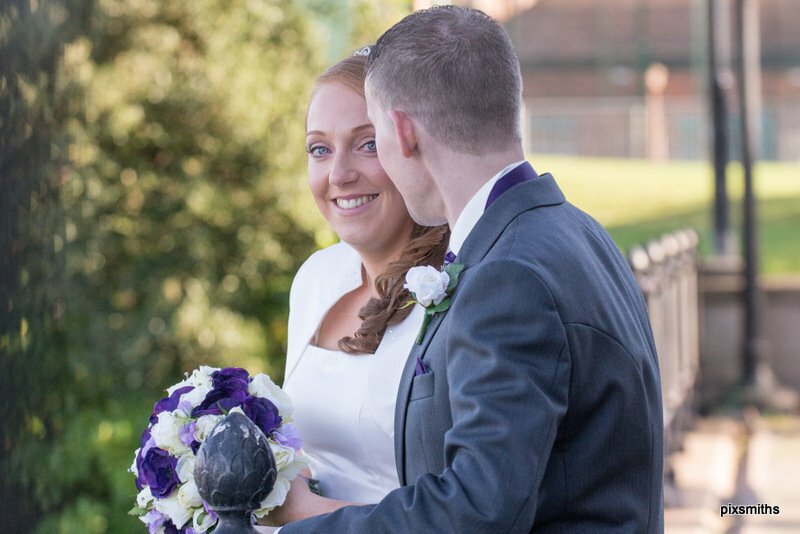 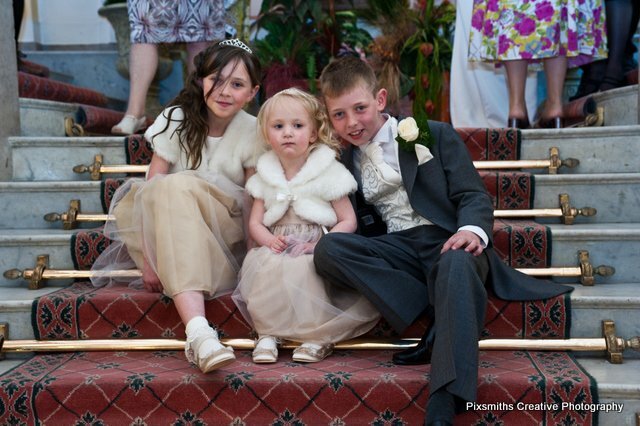 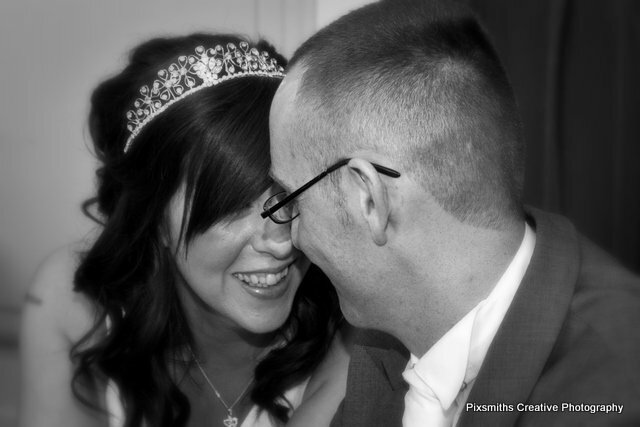 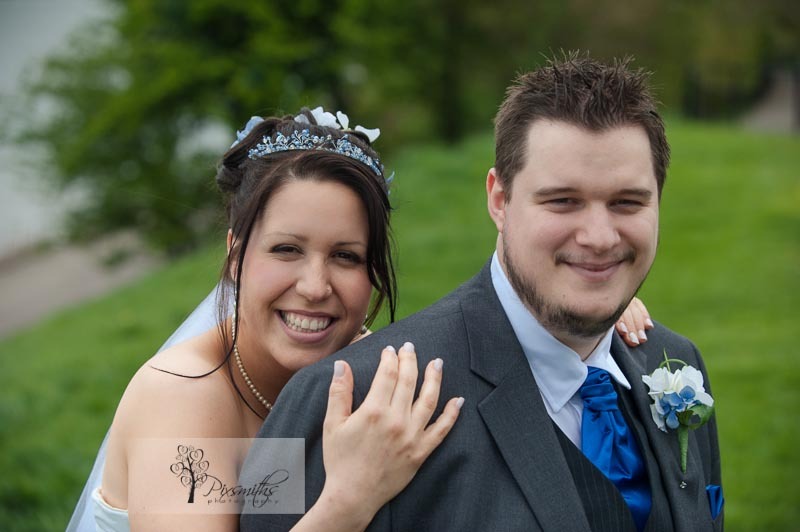 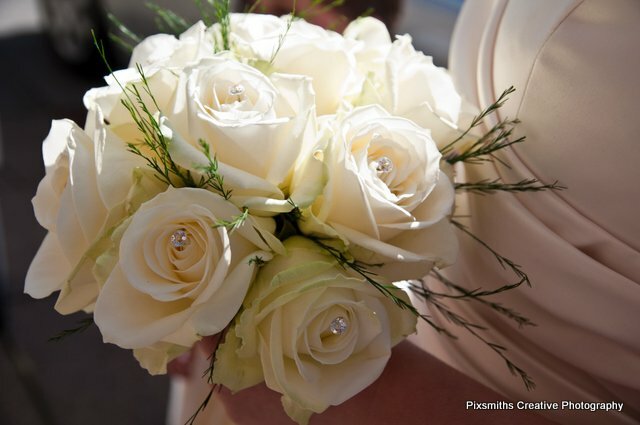 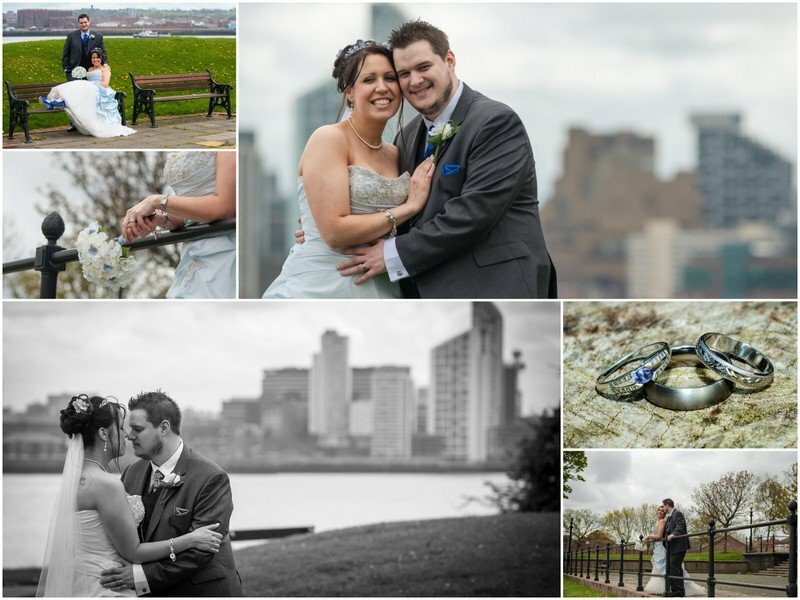 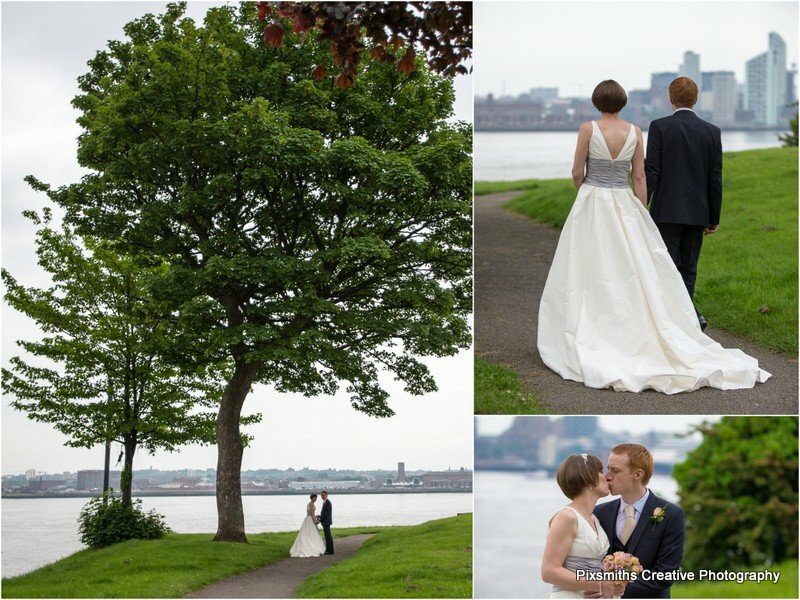 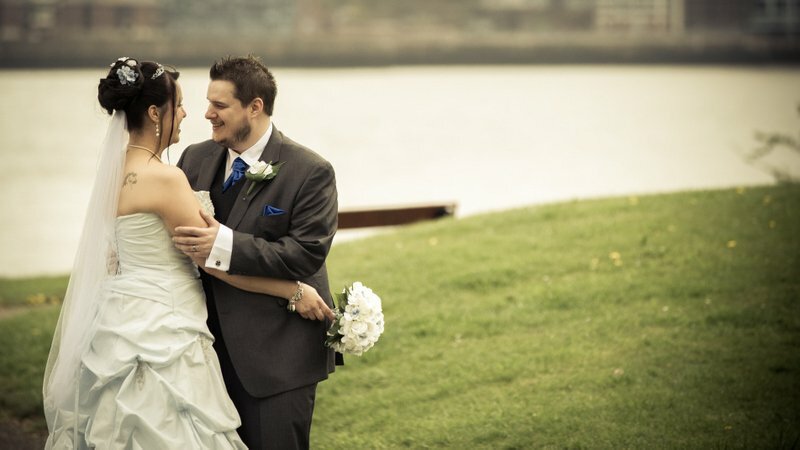 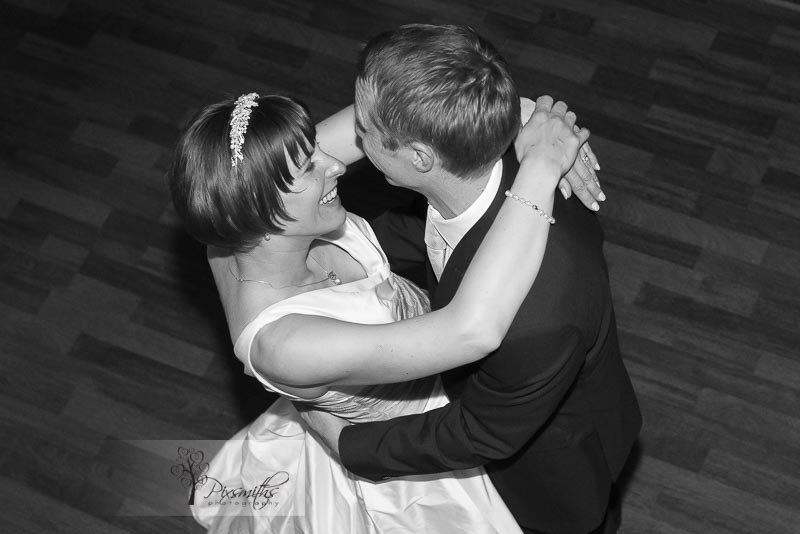 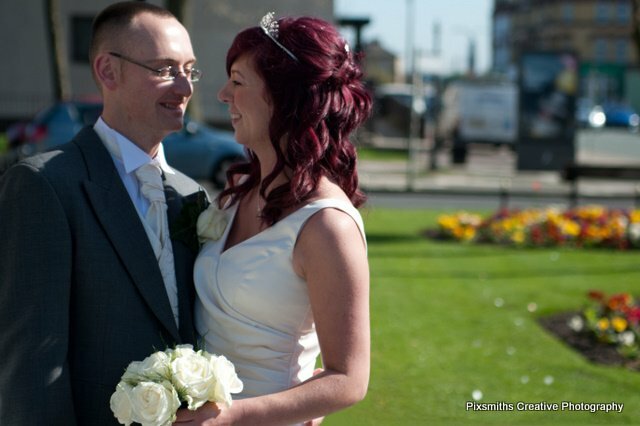 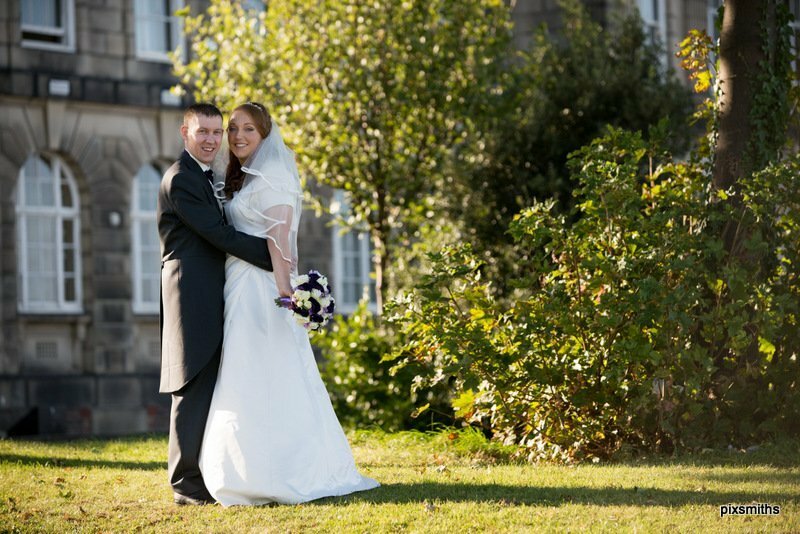 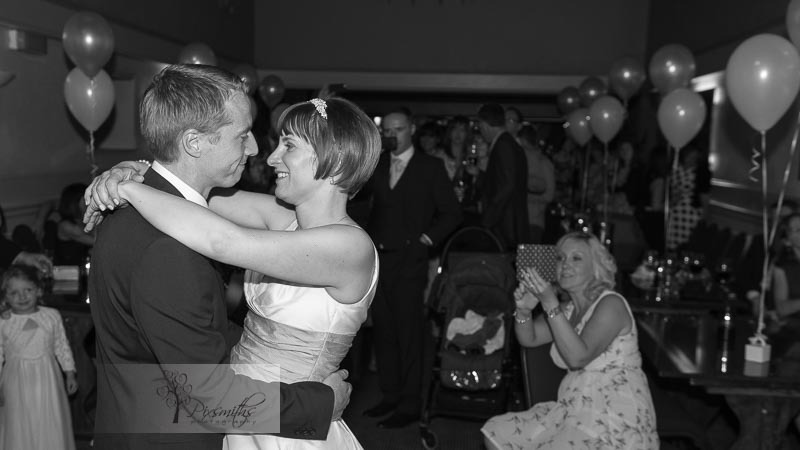 A lovely May spring bank weekend saw Wirral wedding photographers Pixsmiths cover two enjoyable weddings . 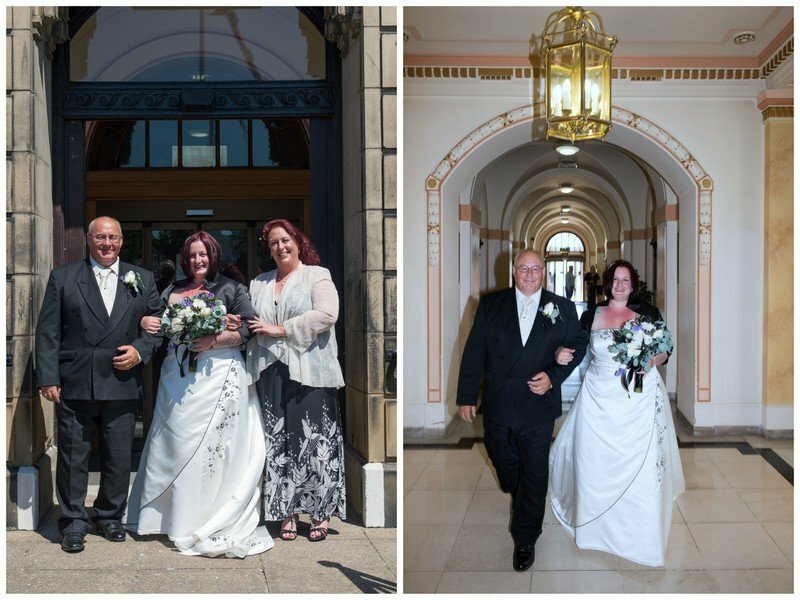 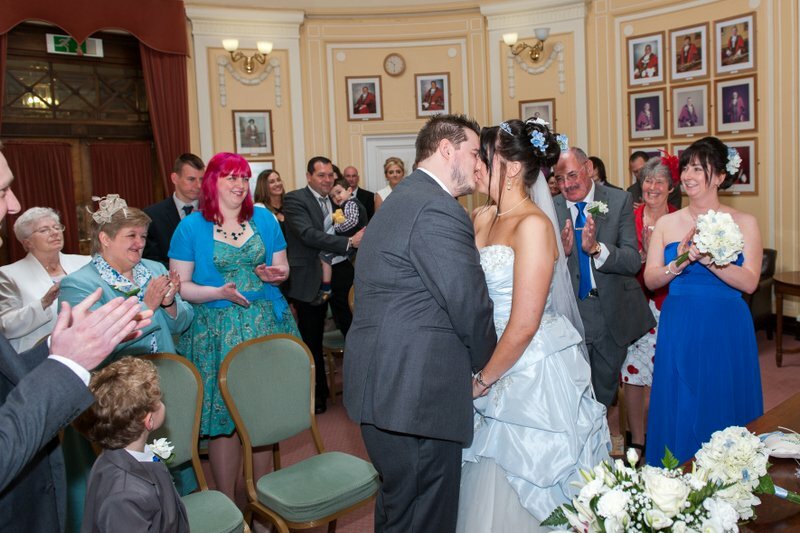 First Ali and John with their civil ceremony at Wallasey Town Hall where the bride entered to a piece from Star Wars. 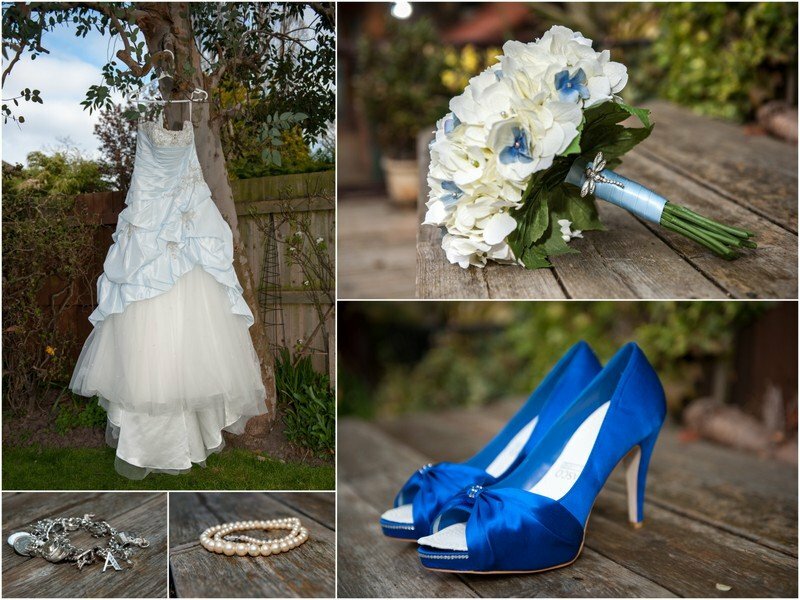 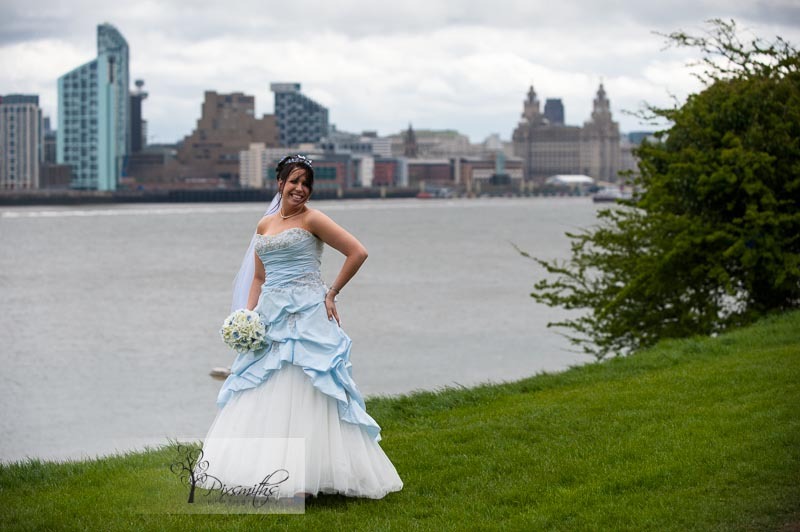 Ali wore a beautiful powder blue and ivory dress from Opulence in West Kirby – just suited her personality so much and blue shoes to co-ordinate. 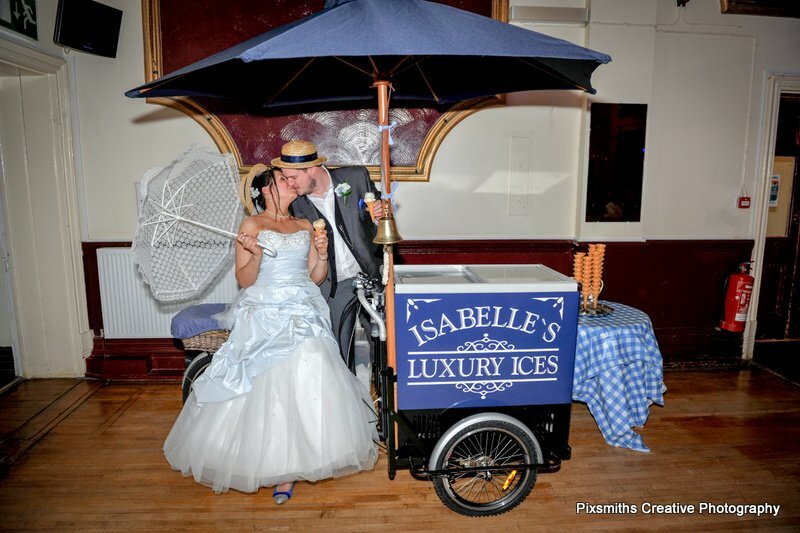 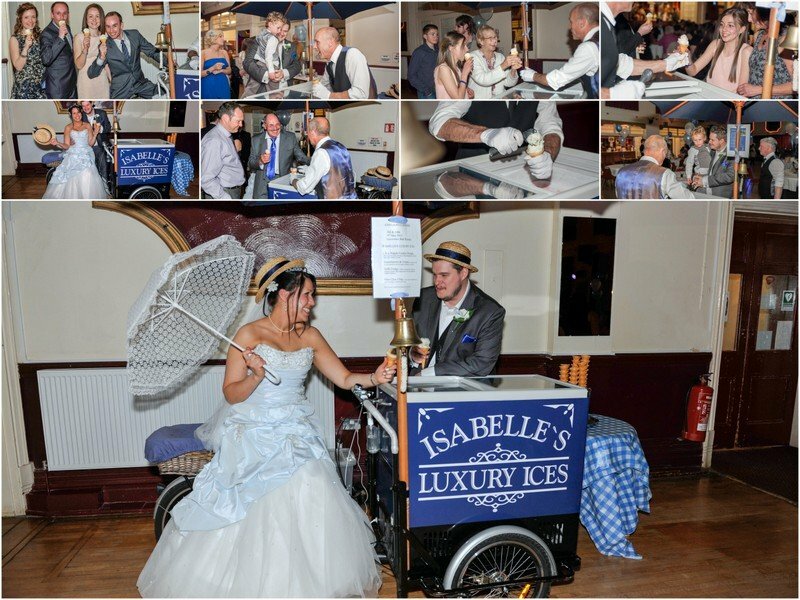 Buffet by Alley Cats and Ice cream provided by Isabelle Ices went down a treat – the ice-cream trike still a talking point among guests I’m sure! 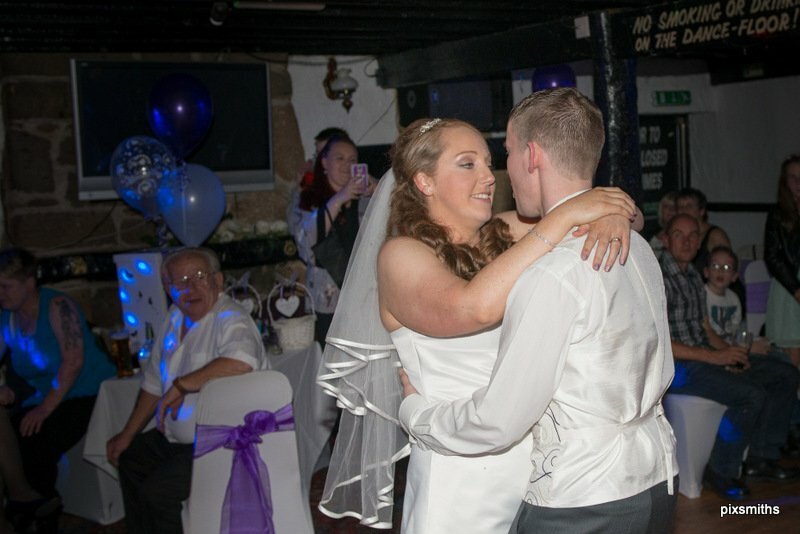 Many congrats Ali and John we know how much fun you had on your day and wish you much future happiness. 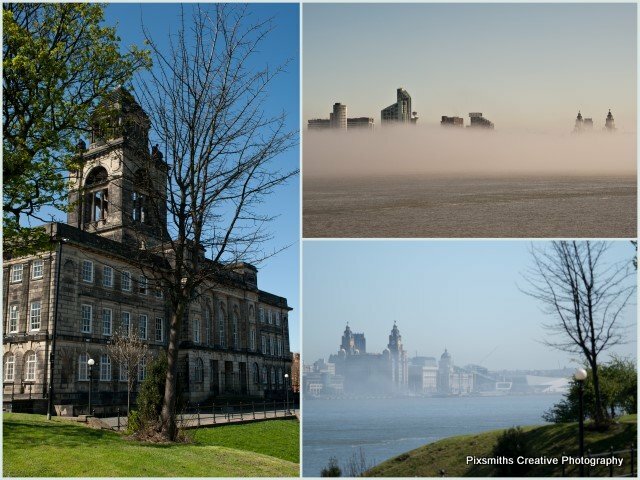 Here are a few favourite images from the many captured during the day and evening. 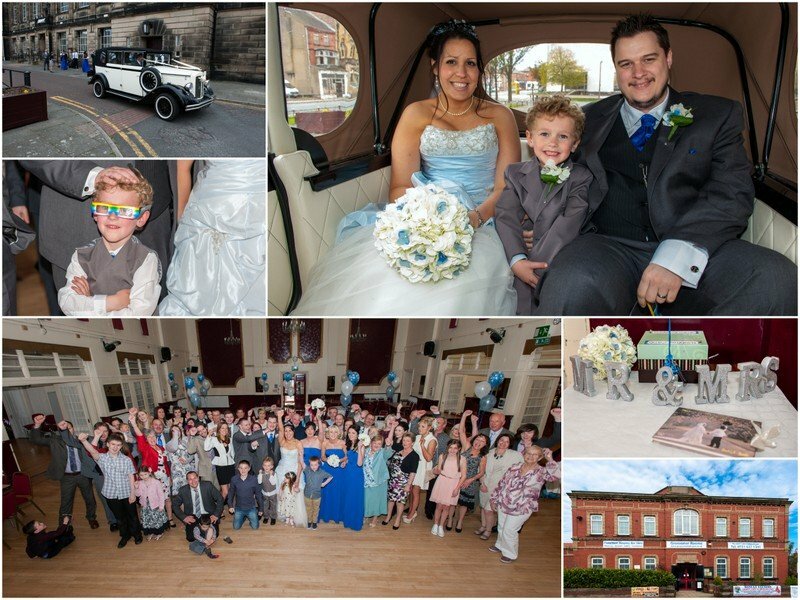 A midday sea-mist across the Mersey and blue blue skies accompanied the wedding of Mike and Sarah at Wallasey Town Hall last Friday. 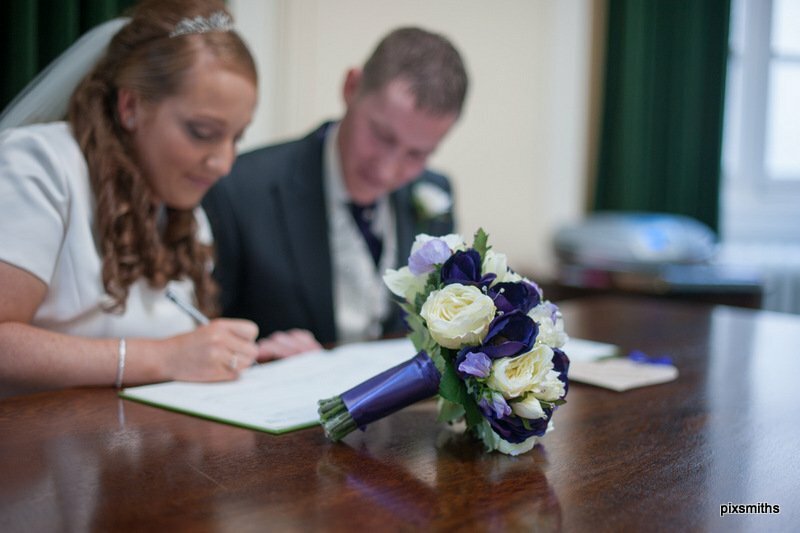 Very considerate of Sarah to have hair colour to compliment our web site colours too! 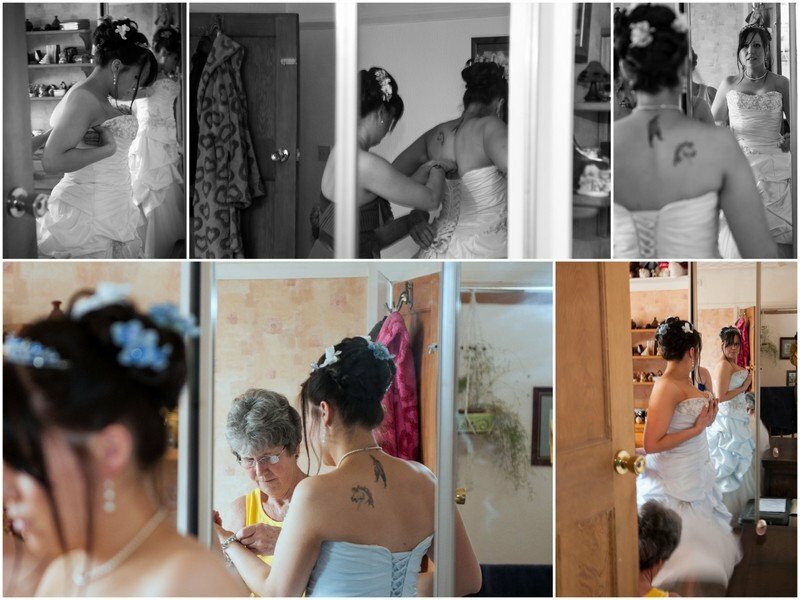 You looked stunning. 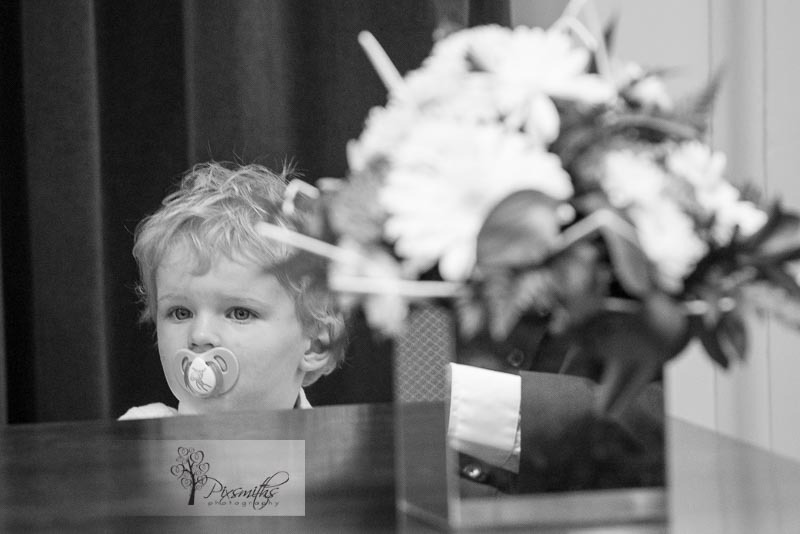 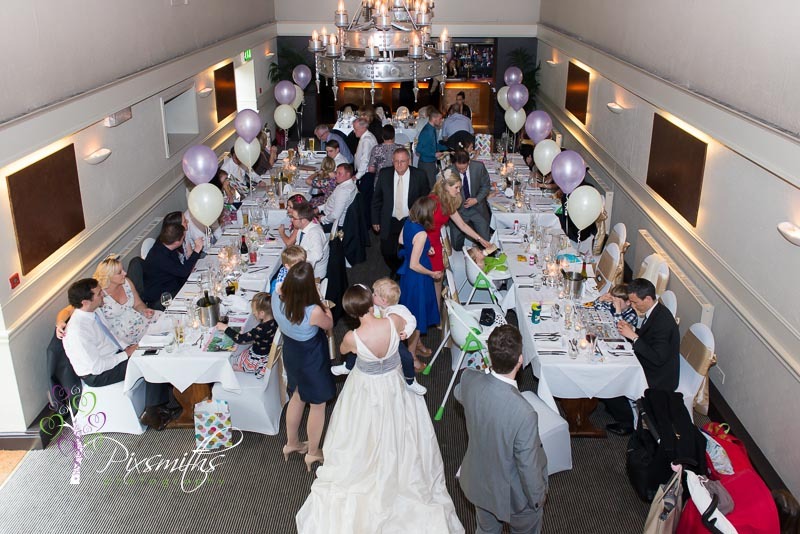 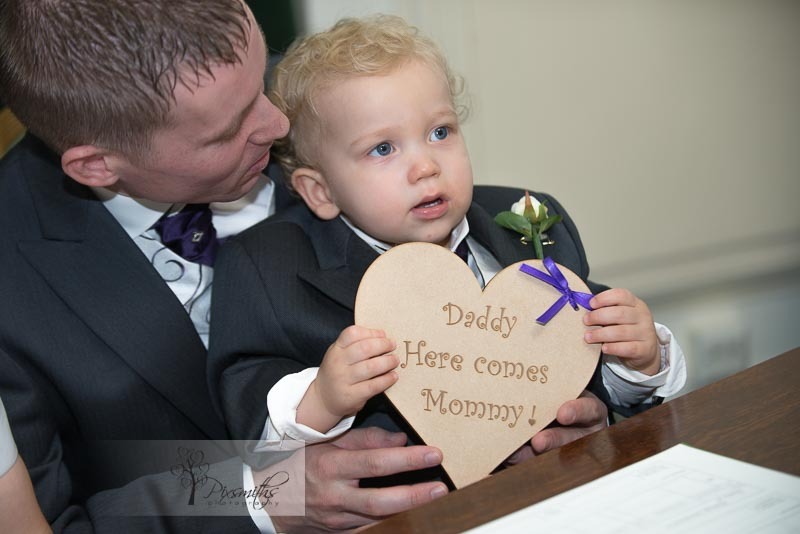 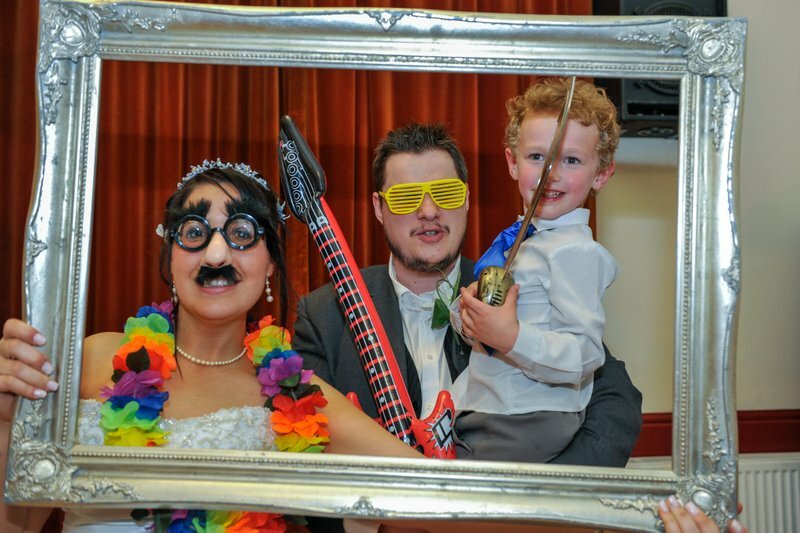 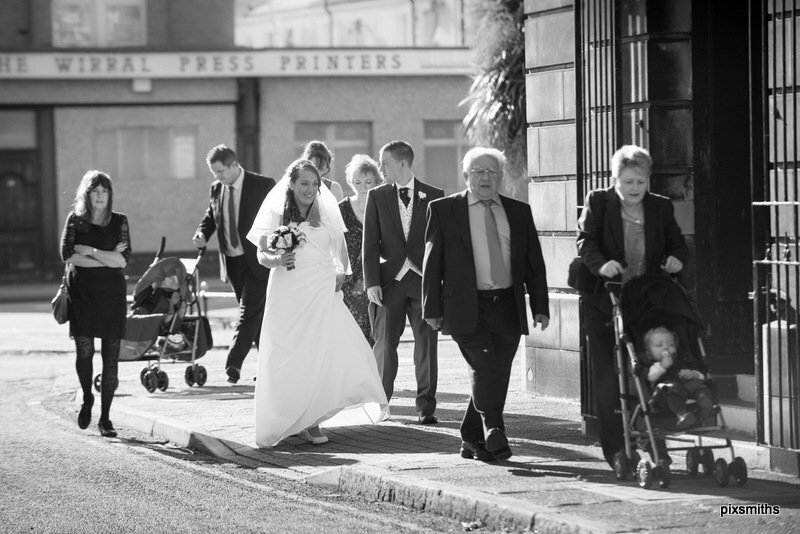 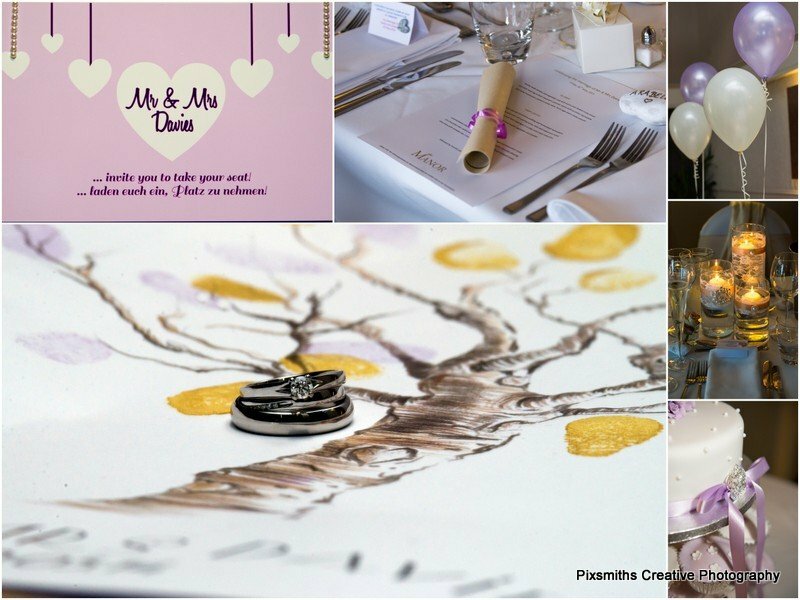 Pixsmiths had the pleasure of capturing their memories on this lovely family occasion. 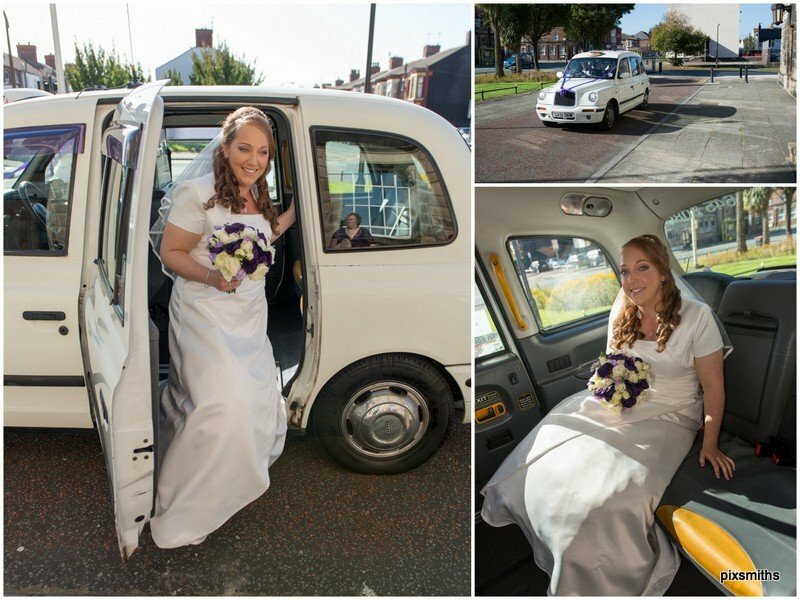 A small reception was held at the OC Club in Bromborough before they sped off for a honeymoon weekend. 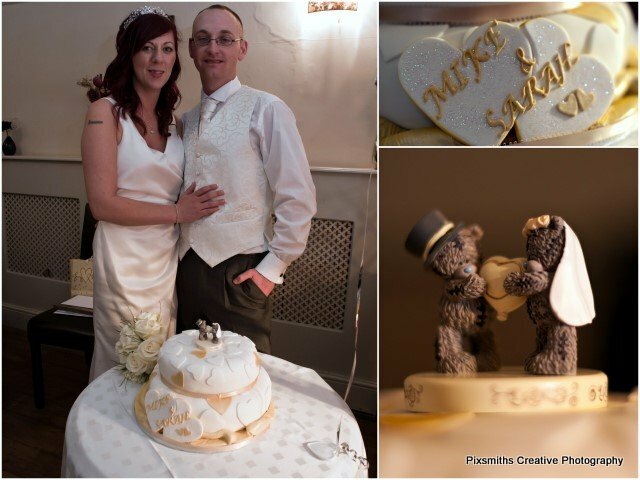 Many congratulations to you Sarah and Mike, wishing you many more years of happiness.